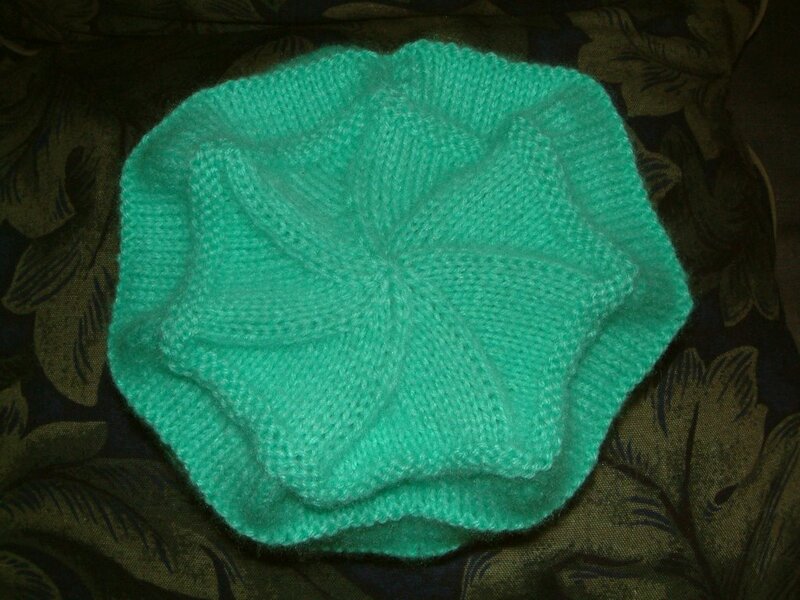 Sue's hat is finally done, I hope she likes it. It is the Knitpicks Chemo Hat. I just need to find an envelope so I can send it to her. I also need her mailing address. I asked Rob but he didn't have it. 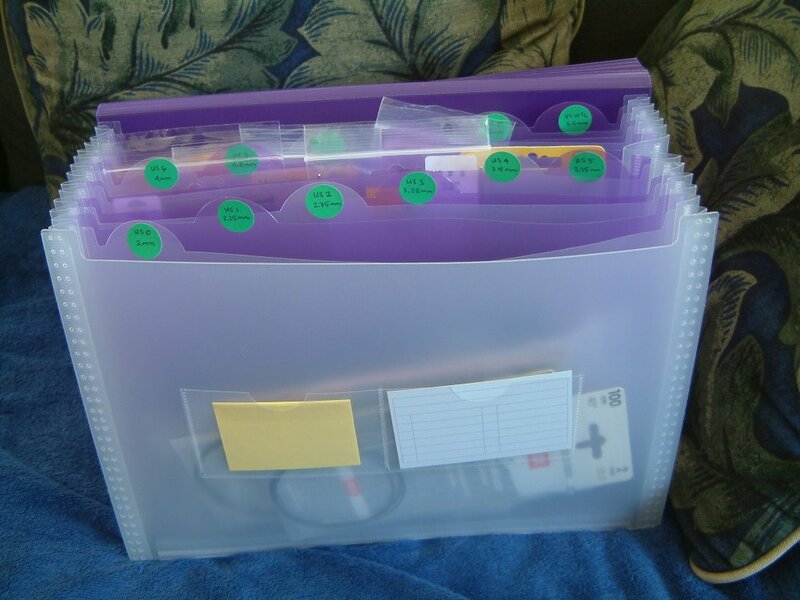 Will check with Karen as I think she visited Sue recently; she is one of the most organized people I know. 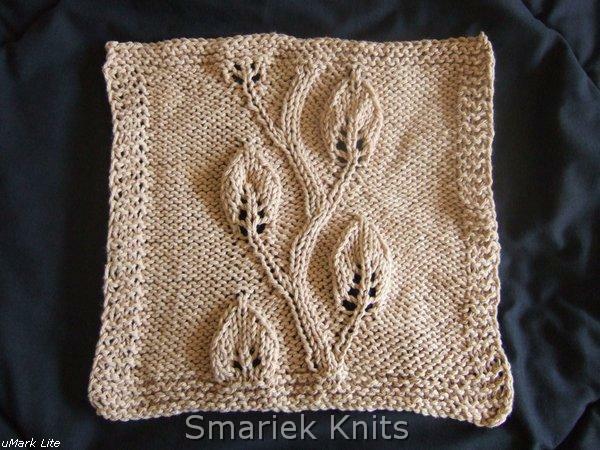 While I'm getting this one ready to send to Sue, I will also get the Branching Out scarf ready to send to my midwife. I meant to send it to her last month but haven't gotten around to it yet. Things move slowly in this house, especially with a "high needs" baby around. 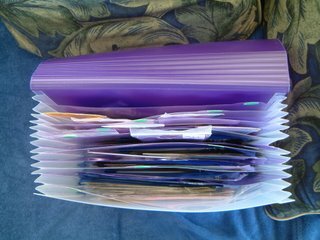 I couldn't go to the post office last week because of all the rain. I'm hoping there'll be a sunny day (ok, I'll settle for a non-rainy day) this week so I can walk over there. Mobility is limited with baby it tow. 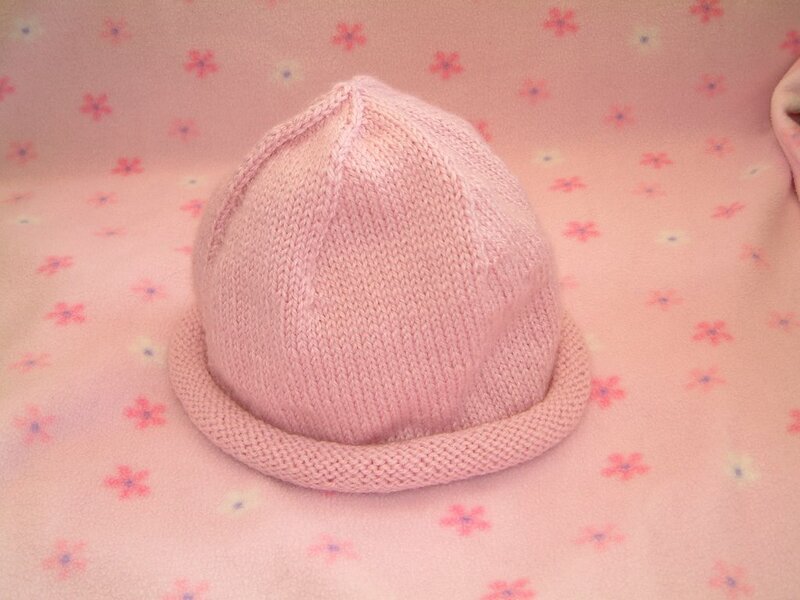 The picture above doesn't really capture the actual shape of the hat because of the unusual shape of the model's head. 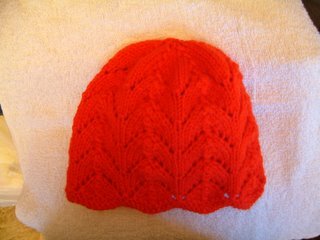 You can get a better idea of the shape from the first Knitpicks Chemo Hat I made; that one is going to the UCSF Oncology Center. The model in these pictures is my baby girl's Fisher Price Laugh & Learn Puppy which she received for Christmas. She's still warming up to it. I don't know if she likes "noisy" toys, but I do know that the lights (on the bone) catch her attention. She squeals at this toy. 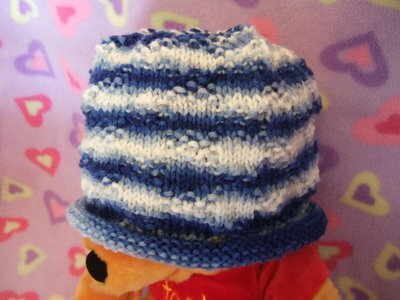 I love the swirls on top of hats. This one is especially pretty. It's hard to see on such dark yarn, it looks similar to the other Knitpicks Chemo Hat I made in lighter green yarn. I learned something recently about chemo hats from a breast cancer chemo patient since last May who is on her third chemo treatment. She told me that losing hair is a real trauma along with everything else and that most people don't even want their families to see them bald, at home, in bed, or wherever, at first. 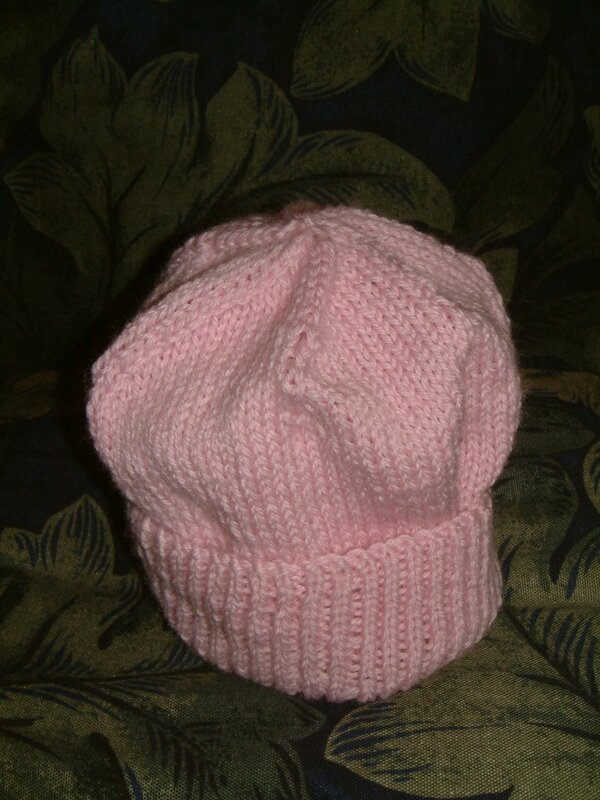 She suggested making chemo hats out of cotton or lighter weight yarn that can be worn indoors as well. That's good to know! I hadn't considered this before. I hope Sue doesn't mind that this is a "hand wash, dry flat" yarn. That's the thing about yarn ... softness is almost always inversely proportional to care, and most natural fiber yarns are hand wash. I picked up this yarn from Elann. I'd love to get more but they are down to one ball left in inventory and it's in yellow. 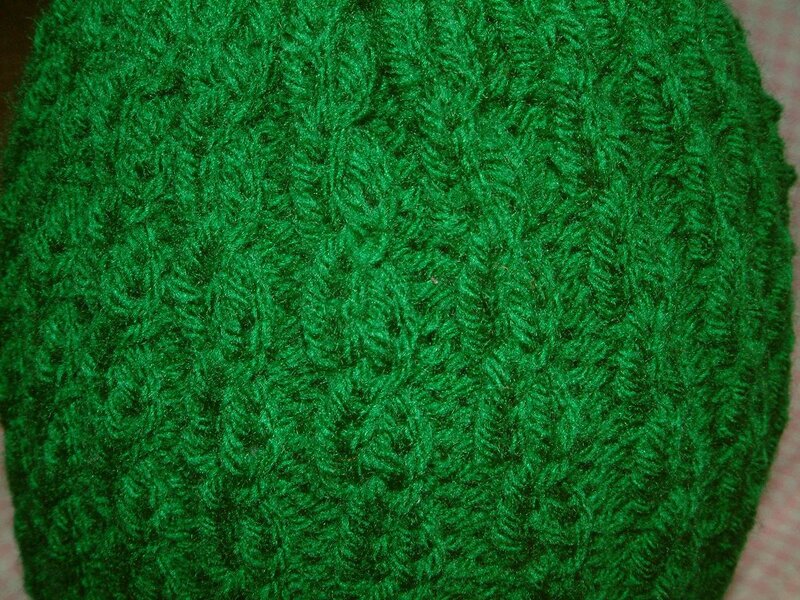 I guess I'll have to go to eBay if I want to find more, there's always somebody on eBay selling this yarn. 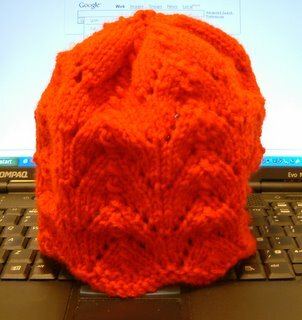 Knitting this hat seems a little easier the second time around. The 4-row Short Row Shaping sequence seems a little easier since I already did it 6 times on the previous hat. Sorry no pictures of the hat, too exhausted at the moment. 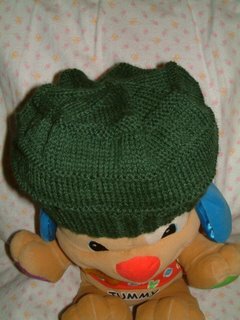 And by the time I get the pictures downloaded to the computer and then uploaded here, the hat will have already been completed! Stay tuned for a picture of the hat... I expect to have it finished within a few days. Here's another hat for the UCSF Oncology Center. This Knitpicks Chemo Hat is really cute. 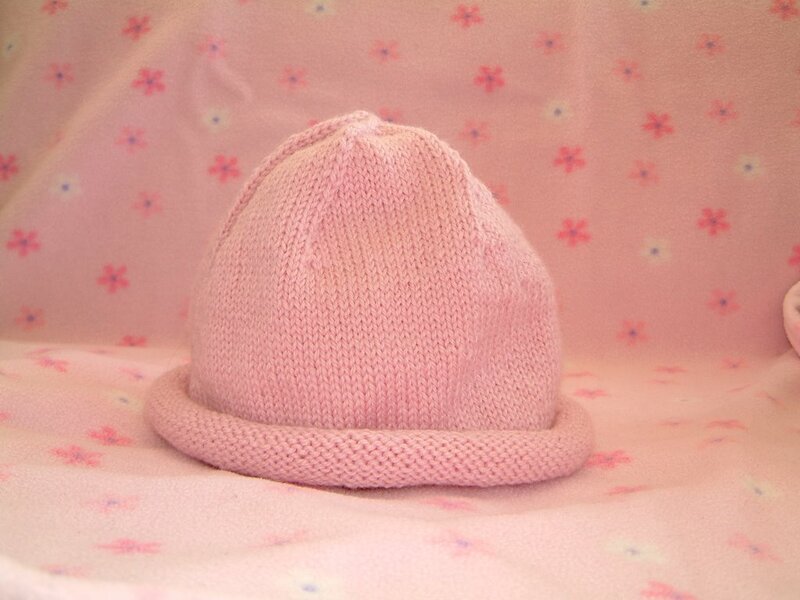 It even looks cute when I put it on my baby girl, although the hat is too large for her. Yes, I like trying on the hats on her, she even looked cute with Chemo Hat #3 on her. :) DH says she looks like a "mushroom" with this hat on. She never sits still long enough for me to take a picture of her wearing these hats though. This yarn is pretty soft for 100% acrylic, I think anyone who is bald should have no problems wearing this against their skin. The hat is lightweight, so the hat doesn't sag or fall off the head. I have some yarn leftover, but not enough to make another Knitpicks Chemo Hat, I'll have to see if I can get another ball to make a second hat. 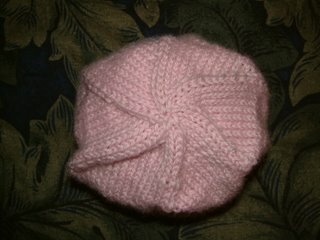 While knitting this hat, I learned how to make a non-YO increase. I did a M1F increase for the very first time. It wasn't so bad. The pattern specifically states the backward loop method of increasing. I decided to go for the M1F method since the backward loop sounded much slower to execute. 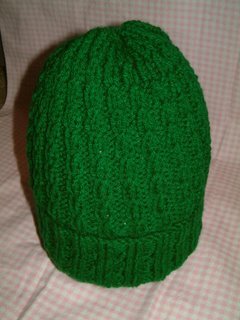 I started the Knitpicks Chemo hat using some green brushed acrylic sport weight yarn. This yarn is pretty soft. 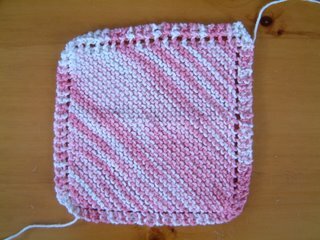 It takes a long time to cast on 104 stitches. 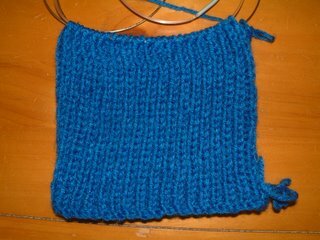 I counted numerous times to make sure I had 104 stitches before starting the K2P2 ribbing. Knitting so many stitches using sport weight yarn takes forever... you knit so many stitches and get so little mileage compared to knitting with worsted weight. This hat is going to take me longer to finish. 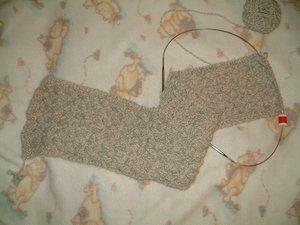 After doing the K2P2 ribbing section, I increased to 130 stitches. Hey, that's a lot of stitches! 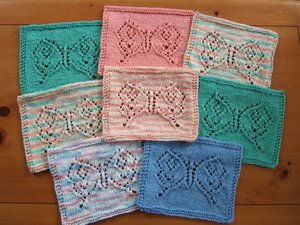 I've completed three sections of the Short Row Shaping Sequence. I can't figure out why I have loose stitches in the second and third sections when I know I pull tightly on my stitches near the marker. I think it has something to do with how the Short Row Shaping Sequence works. 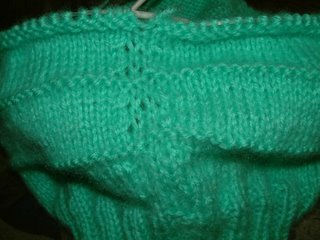 You knit to almost the end, turn, purl back to almost the end, turn, knit back to marker, etc.... and in that process, there is one stitch/column that doesn't get knitted during that back & forth sequence. This yarn is pretty soft but has a bit of fuzz/halo around it so it "sticks" together, making it very difficult to tink back, which I have had to do when I made mistakes. I have a hard time keeping my place in the 4-row Short Row Shaping Sequence because I can't always finish it all at once. When I pick it up again, I forget where I am and usually end up turning where I shouldn't, nevermind that the marker is supposed to tell me where I am in the round. 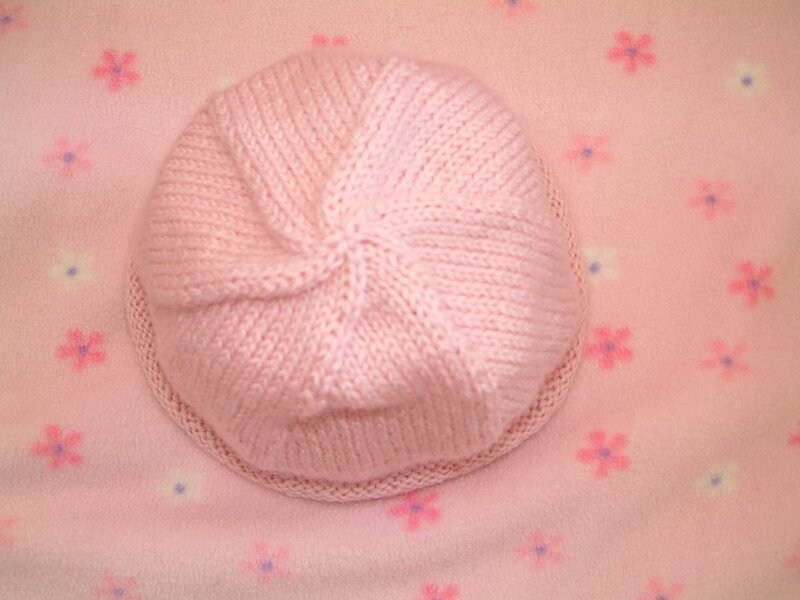 I really enjoy working on all these chemo hats, they're a lot of fun to work on. I think about what I'll do with the next hat as I am working on the current one. 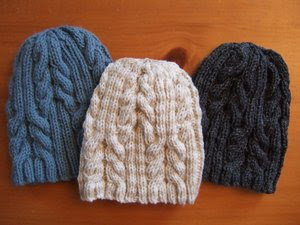 I keep coming up with all these wonderful ideas to try for future hats and wish I coud knit faster so I can start up all those WIMs (WIM=Works in Mind). Chemo Hat #5 is a little different, featuring a fold up cuff/brim with some cable detail. I'm pretty slow at working cables. I also find that the tips of my fingers get sore when I work on too many cables, it has something to do with how I work with the cable needle and how I use my fingertips to push off the knitting needles. 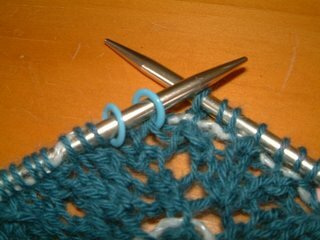 This time I used a Brittany Birch cable needle which is infinitely better than using the metal "J" shaped one I used to use. Yarns tended to slip off the metal one. I didn't have to worry as much about this happening with the birch cable needle. I don't think I'll go back to using the metal one. I've discovered that I don't know how to count. 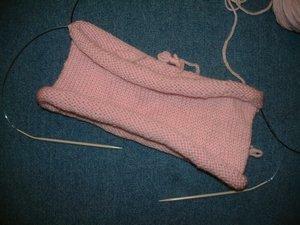 I casted on 84 stitches, and even counted them twice before I started knitting. 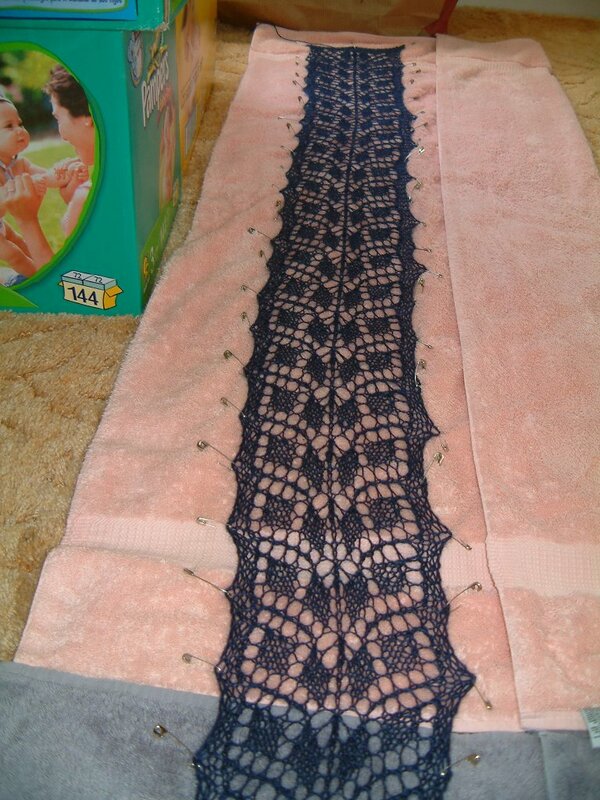 However I got to the end of the 5th row (cable row) and was one stitch short. Doh! (Must be a combination of "Mommy Brain" and lack of sleep.) Well that won't work. I had to frog the entire thing and start over. Sigh. At least I joined the round both times without twisting the stitches. This hat is pretty snug due to the cables in the brim. 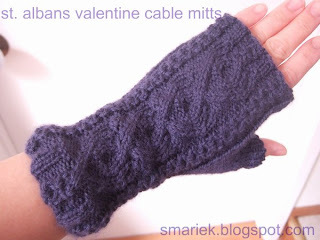 Cables tend to "compress" the knitting a bit. 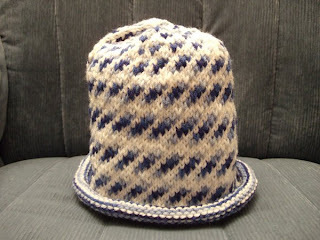 The non-brim portion of the hat is a bit "looser", but it stays in place because of the brim. This hat looks cute on me, and it feels very warm because it is essentially a double layer all around the sides. 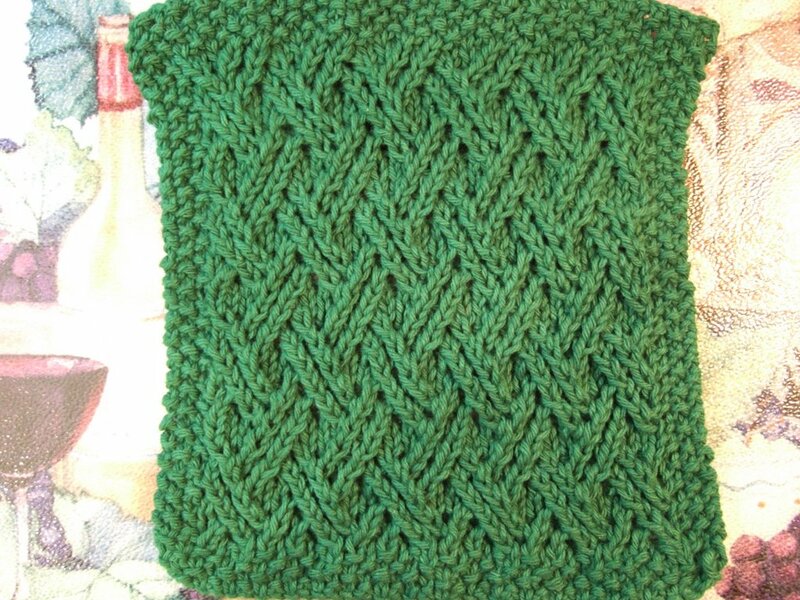 I like how the yarn gathers up at the top. 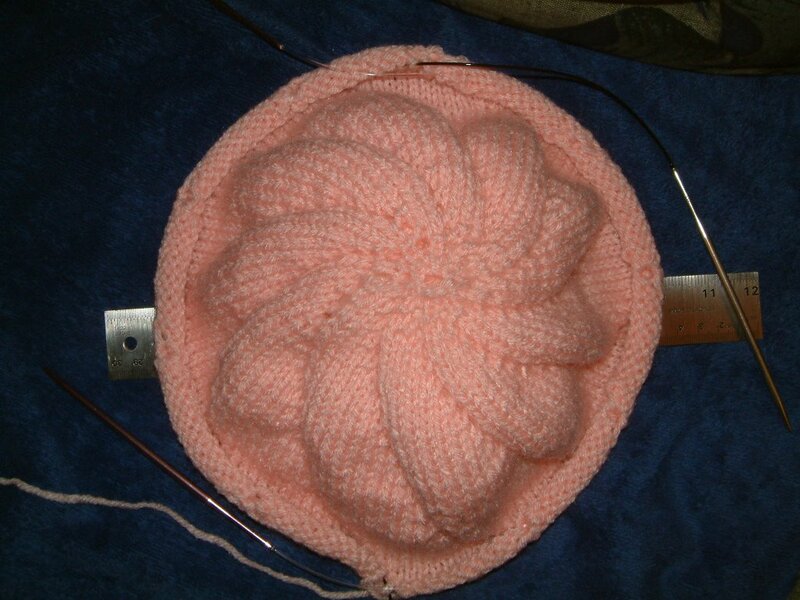 I started the cable brim section using US8 needles, then switched to US7 for a tighter body. 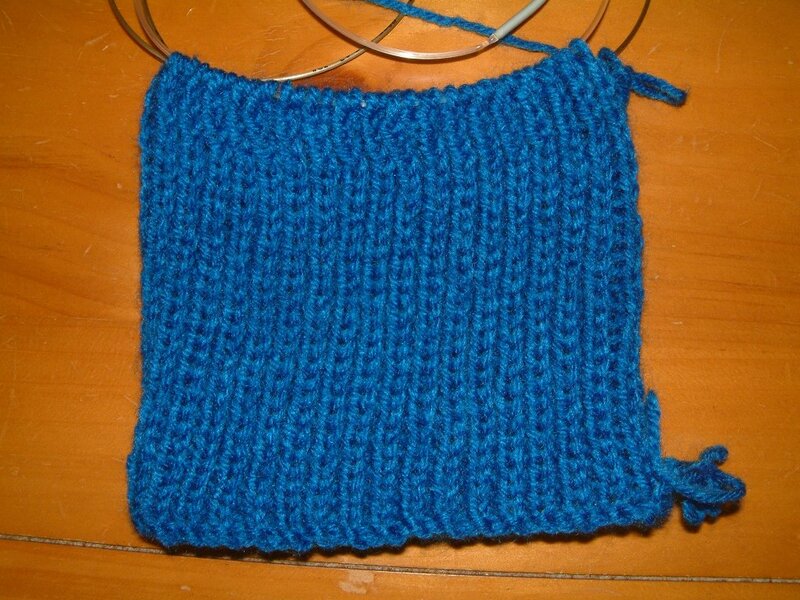 This didn't work out as expected because I had forgotten how cables tend to compress knitting. Next time I will either try downsizing to US6 needles or decreasing the number of stitches to 72. 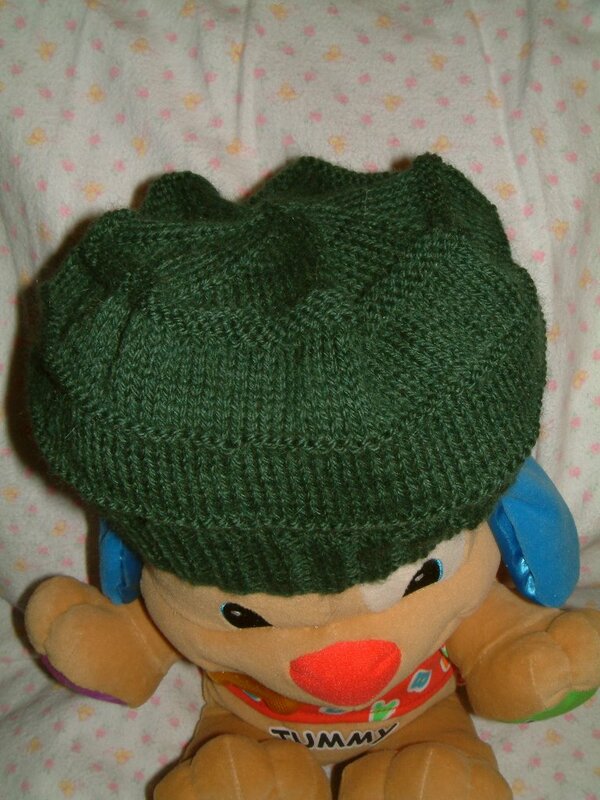 Fold up brim type hats such as this one, and the stretchy fold up brim/watch cap types like the green baby cable rib hat and the blue marsan watch cap, tend to use a lot more yarn. 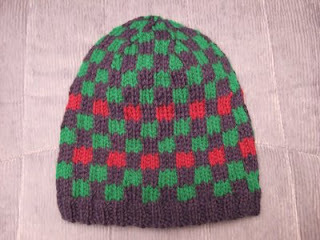 Of all the chemo hats I've made so far, this one has used the most yarn, nearly 4 ounces of worsted weight yarn! 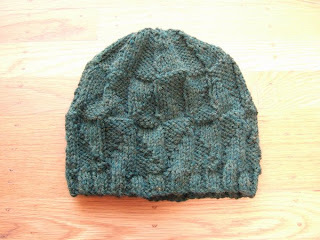 I'm going to look through Barbara Walker's Treasury of Knitting Patterns #1 & #2 for cable patterns to use in making another hat similar to this one. Since I don't have anyone to model my hats, it is being modeled by my Pottery Barn "office" bowl propped up by some Rubbermaid containers. 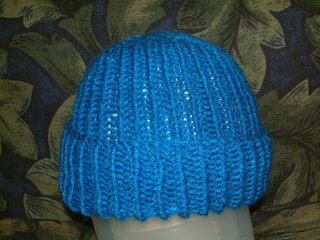 Chemo Hat #4 is finished. Although it was repetitive K1P1 ribbing, it was a nice change to do a right twist on the Knit stitches instead of doing plain K1P1 ribbing, however any type of ribbing is slow going compared to doing stockinette stitch. I took this hat with me when I went out, knitting a little as I nursed my baby in the Nordstrom ladies lounge. There was one time when there were three other women feeding their babies. Two women were breastfeeding, and the other one was using formula. It's nice to see other women breastfeeding, it makes me feel like I'm not the only one doing it. 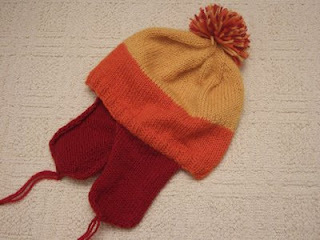 I love how the ribbing in the decrease matches up with the ribbing on the rest of the hat, very nice! It looks pretty from the top. The hat is stretchy so it will fit snugly. In the end, I eventually decided to make the same blanket I made for Marisa last January. Oh my, casting on 240 stitches takes forever! 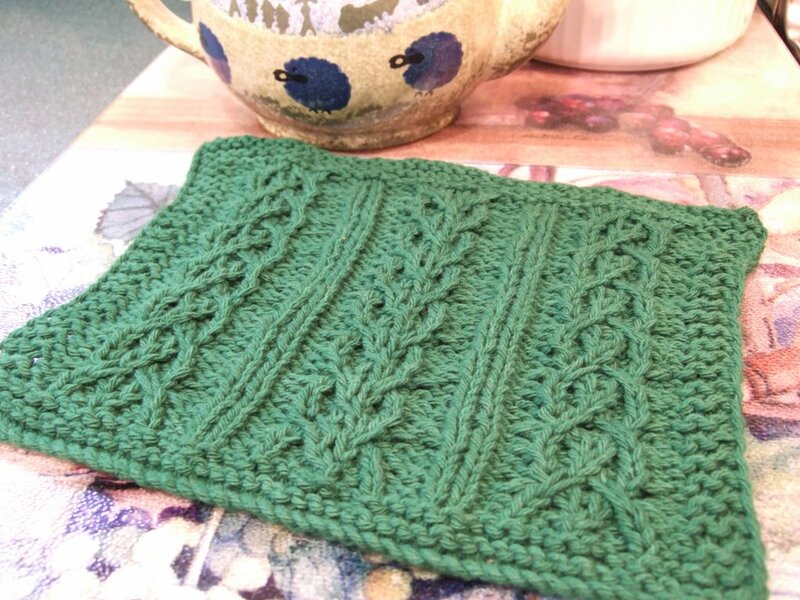 As I was knitting the first row of the pattern, the number of stitches didn't work out in the end ... I thought I counted wrong when I cast on my stitches. 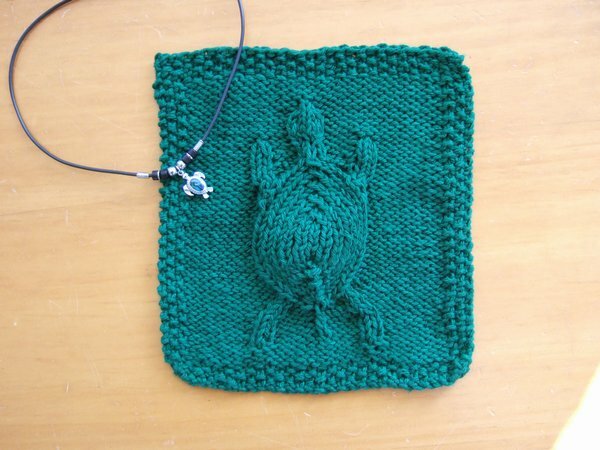 I was afraid I would have to frog it and re-cast on 240 stitches. 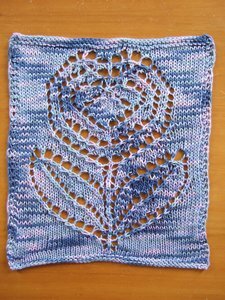 Fortunately, I "read" my knitting and saw where I made a mistake in the pattern, lost my place by skipping a few stitches in the pattern. So all I needed to do was tink back about 50 stitches (slow process with lace!) and correct it. All was right after that. Yay! I discovered a US7 needle shortage after starting this blanket. Not the first time though. 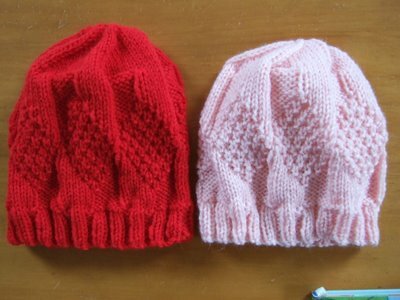 I had already picked up 2 new US7 needles a couple weeks ago so I could work on chemo hats in the round. After I started the blanket, I discovered that I no longer had a pair of US7 needles to start my next hat! I have one 40" US7 needle on my Flower Basket Shawl, another 32" US7 needle on a basketweave scarf. 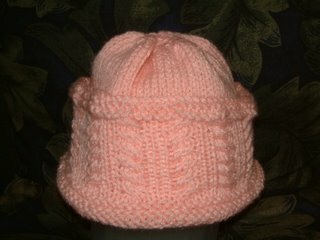 I had been using 32" and 29" US7 needles for hats this past week; then I used the 32" US7 needle for the blanket, which left me with one single 29" US7 needle. Doh! I fixed the problem by taking the basketweave scarf off its needles, and using that 32" US7 needle (along withthe 29" needle) for my next hat. 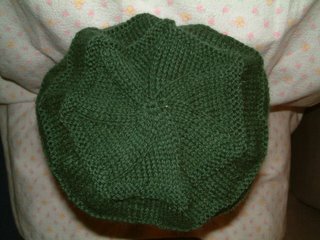 Chemo Hat #4 is sort of a watch cap type hat in that it has ribbing and a fold up brim. 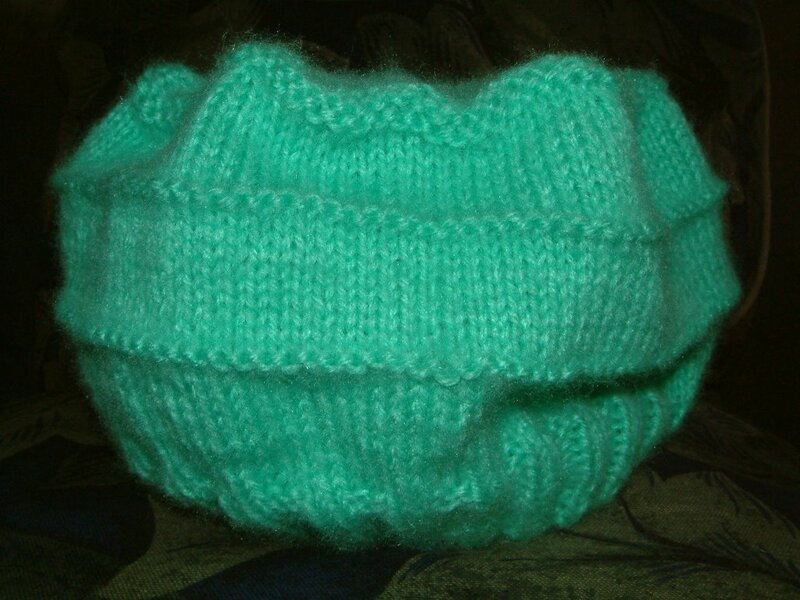 This is the picture of the Wrong Side of the fold up brim (the bottom part in the picture); the Right Side consits of K1P1 ribbing with a right twist in each of the Knit stitches. There is a subtle difference compared to plain K1P1 ribbing. 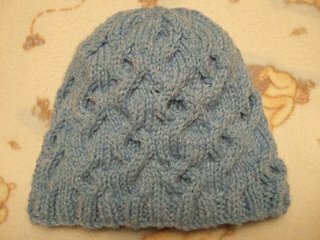 You can kinda sorta see the right twists in the four rounds at the top, which is part of the Right Side body of the hat. Did I just confuse you? I discovered that joining a round is not something I can do while nursing. I ended up twisting my stitches. This Chemo Hat was fun to knit, but with any lace knitting it required a lot of concentration. 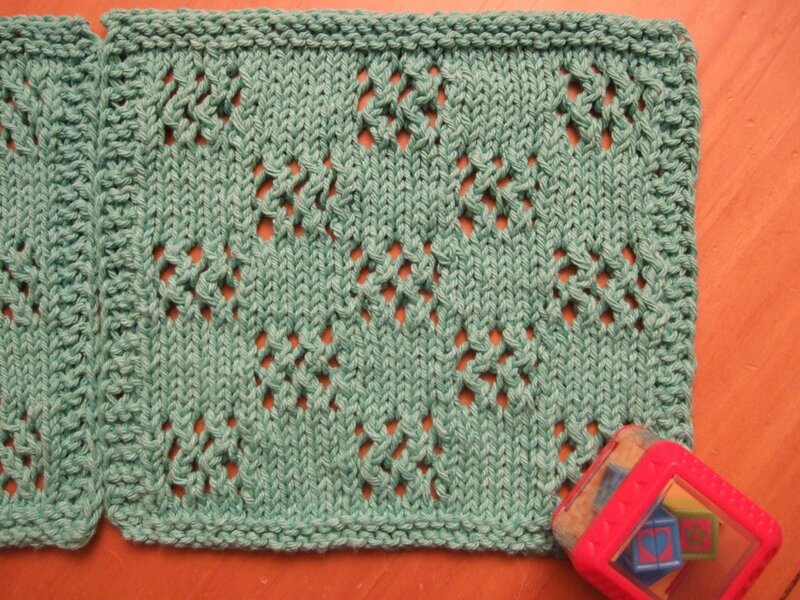 I was unable to knit this while nursing my baby; I'd end up making mistakes, losing YOs, etc. 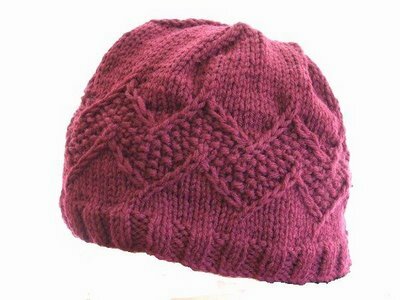 This hat is so pretty, I think I'm gonna make one for myself... :) The pattern is reminiscent of the Horseshoe lace pattern which you can find in BW#1 pg 209. I really like the how the top of this hat looks. Isn't it pretty? Of course the top will only be noticeable if someone short wears it, LOL. Can you believe it? I've cast on this hat 6 times already! Hopefully this will be the last time. 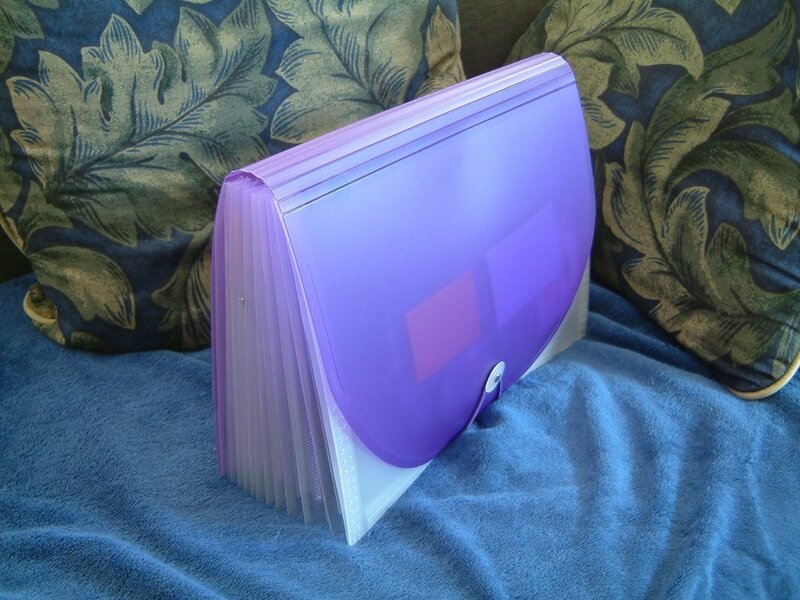 Here is a picture of Version 1. It looks fine from the top. What isn't immediately obvious is how BIG this hat is ... it's so large that it can fit Madame Olympe Maxime! It's hard to measure the circumference (especially with the SS rolling up on the ends) but I think it's 24 inches or more. Someone pointed out that 24 inches is even too big for a man, "even if his head is swollen," and that a woman's chemo hat should be in the 19 to 21 range. I worked the crown increase up to 110 stitches. 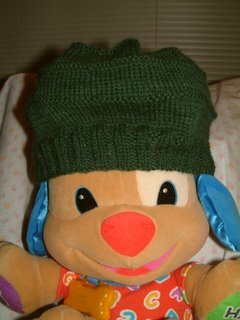 I probably should have stopped at 90 stitches, but at the time I just wasn't sure whether the hat was large enough! The hat looked more "platter" shaped than "bowl" shaped. I was afraid the hat won't be snug enough. 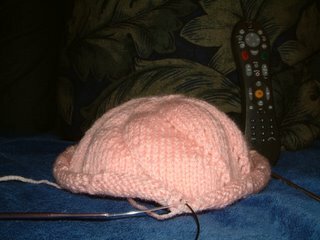 Here is the side view of the large hat next to my Tivo remote so you can get an idea of the size. It's really not a very good picture for showing how large the hat really is though. 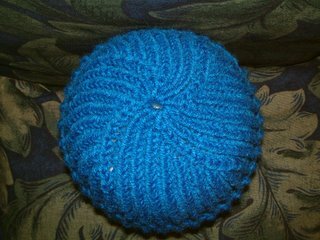 While knitting the hat, it just looks and feels more flat than bowl shaped, I kept wondering when it will start looking like a hat. In this picture, there is a rolled up towel underneat to give it more of a hat shape. Without it the hat will just look like a flat hat. I ended up ripping out this hat and starting over. 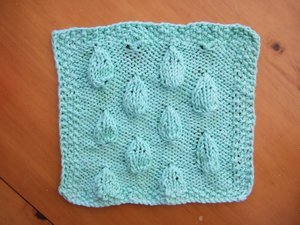 Unfortunately, I ended up re-casting on 5 more times because I would knit anywhere up to a dozen rounds before making a mistake requiring me to frog the whole thing again. (sigh) Of course it didn't help that 3 of those times were in the car; I guess I don't knit as well in a moving vehicle. Hopefully this 6th version will make it to the bind off. Here is the side view of Version 6. 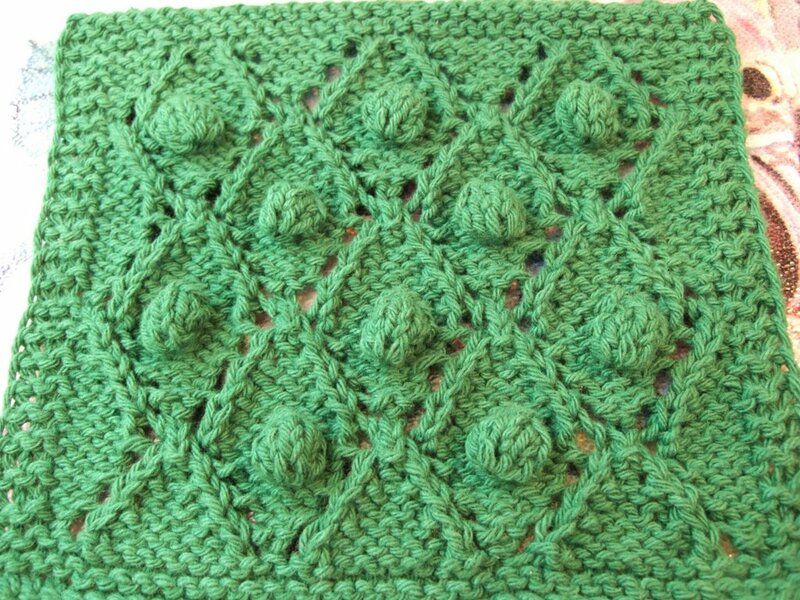 I need to knit about another inch of the pattern, then I can begin the last 1 inch of Seed Stitch. 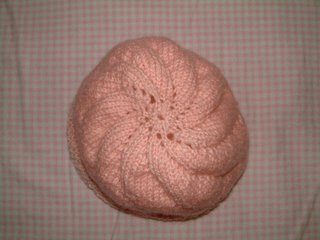 I've cast on my first Chemo Hat using mystery pink acrylic yarn. I measured the yarn; it came out to 10 WPIs ... I figure it's somewhere between a heavier DK weight and a lighter medium Worsted Weight yarn. 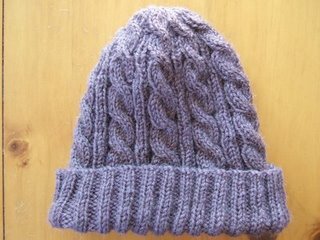 I was thinking of using US7 (4.5mm) needles but did not have any available, so I cast on using two US6 (4mm) needles instead because I thought the hat might not be warm enough if I used US8 (5mm) needles. 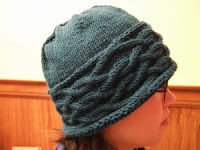 This Nautilus hat is knitted from the top down. The picture above shows the top (crown) of the hat. I love the swirls the YOs make. 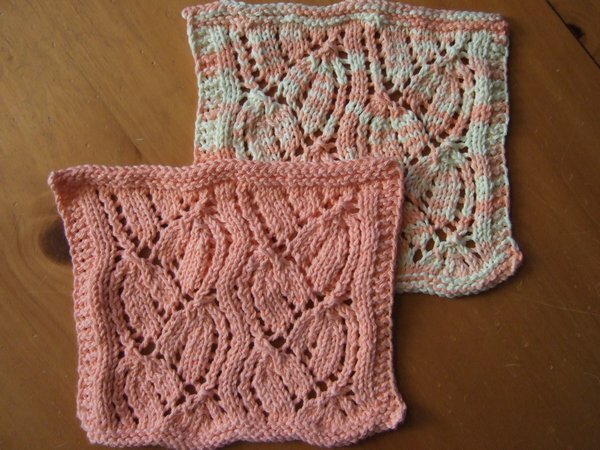 The pattern calls for Paco yarn. 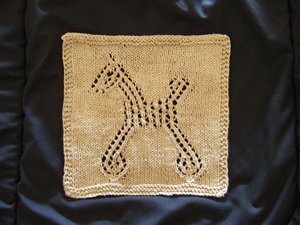 I'm not sure what weight this yarn is and the link on the website no longer exists. 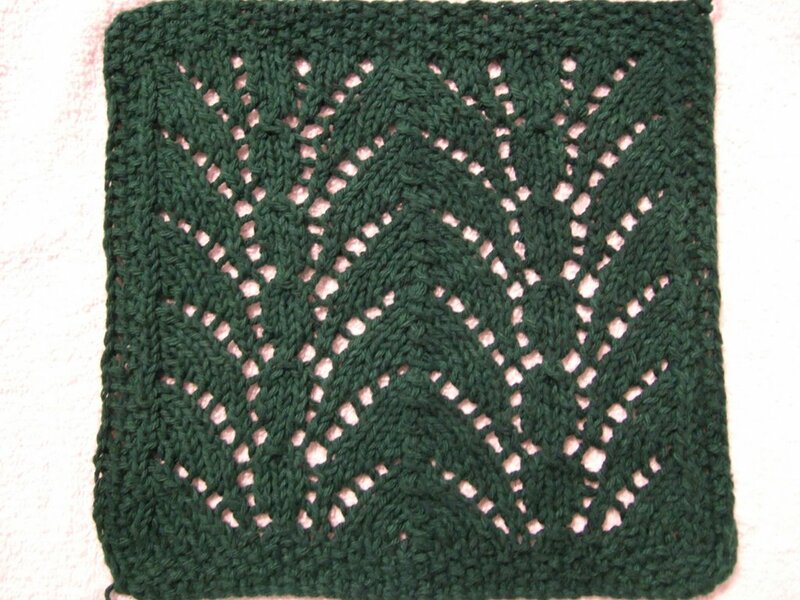 As a result I am not sure I can follow the pattern as is and increase to the number of stitches specified. I may need to tweak it a bit for sizing. 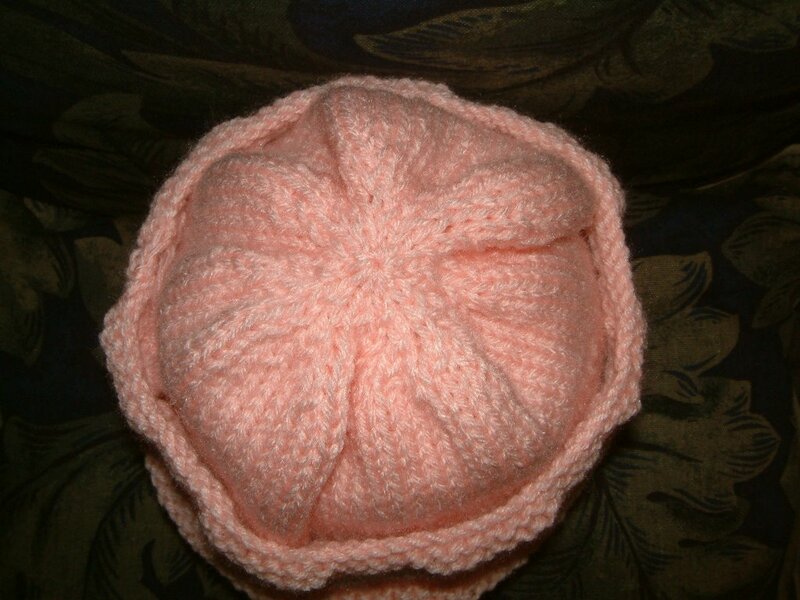 I've learned something new while knitting this hat. One row of the pattern ends with a YO. 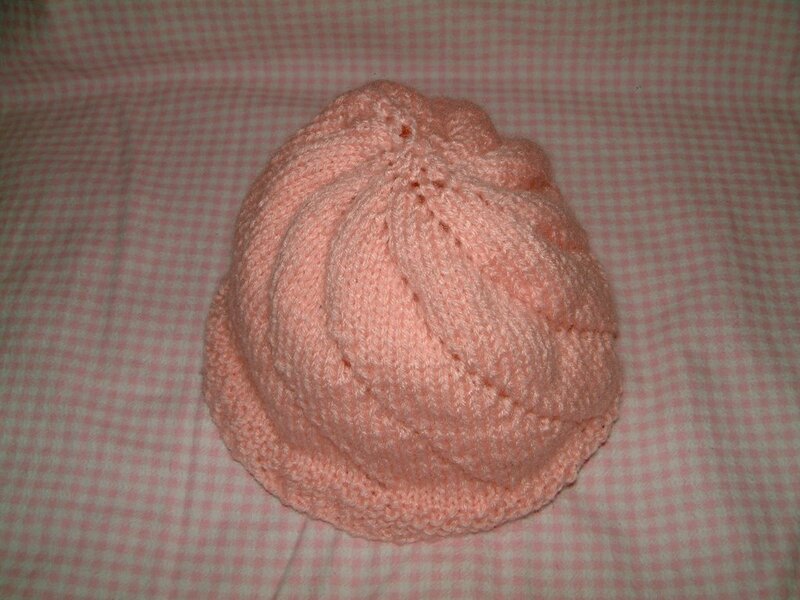 I stopped knitting after working such a row, put the hat in a tote bag, and then picked it up again later to continue knitting the next row. 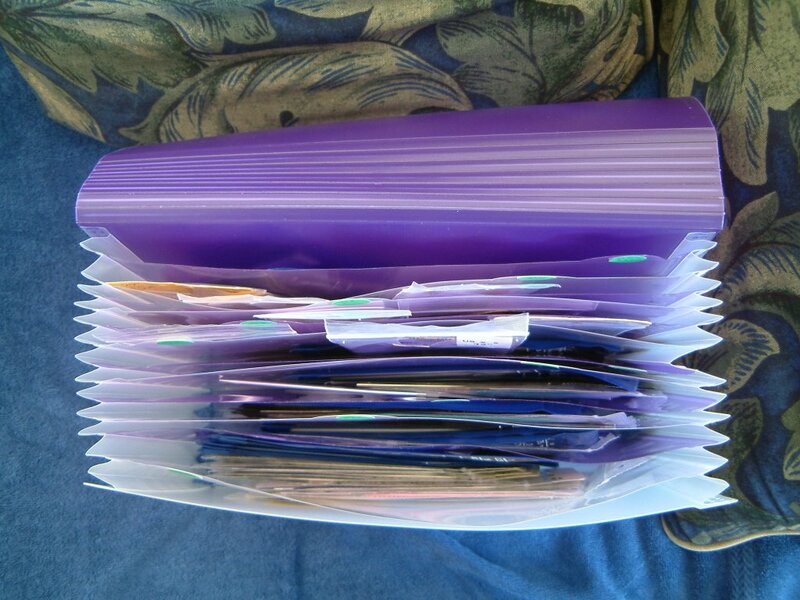 I discovered I lost a stitch on each needle because the YOs fell off while in the tote bag. Doh! I had to go back and fix that. 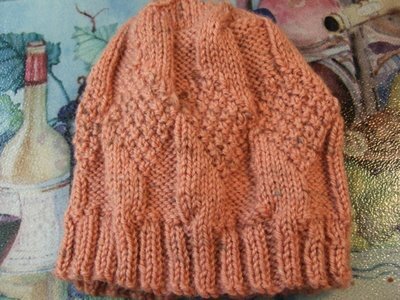 Now I have to remember to only put down this hat after I have completed one of the knit completely across (viz. 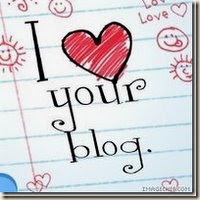 no YOs) rows. 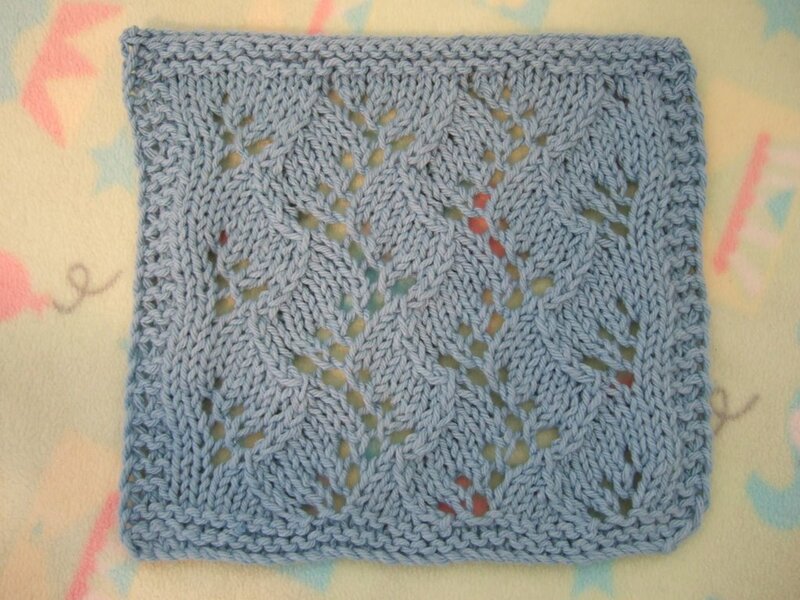 I finally completed my second Branching Out (2 balls Peruvian Collection Baby Silk yarn in Sapphire color, US6 needles). I always procrastinate when it comes to weaving in ends and blocking. As you can see here, it is finally pinned out onto two towels. Boy does it take a long time to put it all those pins! It's not an exact science and I am sure the edges aren't straight at all. I end up eyeballing it since I don't have a blocking board. 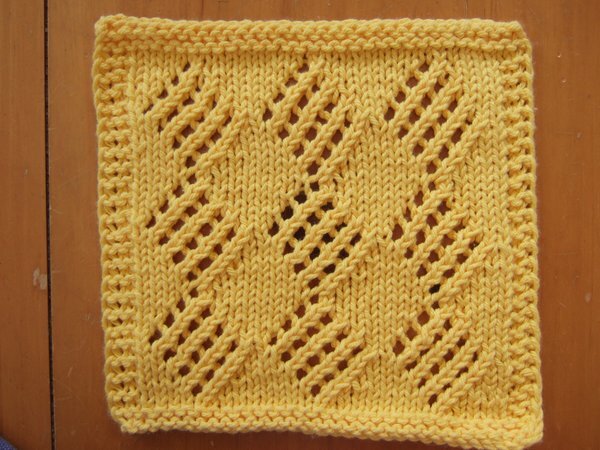 Next time I would like to try knitting this in two pieces and then grafting them so that the pattern is right side up on both ends. I've never grafted anything before and am afraid of messing it up. When I have some time I will play around with grafting before doing it for real. 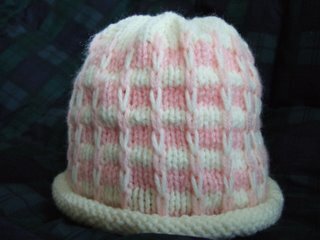 My next project will be the Chemo Hat pattern featured on Knitpicks. I love how it doesn't look like a plain boring chemo hat. I finally looked over the pattern instructions and it looks doable to me. I'm a but unclear on the short row shaping ... I'm hoping it will all come together and make sense as I am working on the hat. 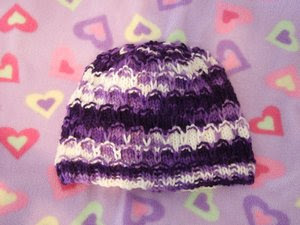 I love the swirls on the top of the hat. I have not done any knitting in a month. :-( I have been too tired to knit, even in the evenings after M goes to sleep. Lately she has been having trouble staying asleep, so we have to go soothe her numerous times in the evening and at night. When we're not doing that, we cook and eat dinner, shower, and try to wind down before going to bed with the hopes of getting at least an hour of sleep before she wakes for her next feeding. My wind down period is about 1/2 hour if I'm lucky and I'm too brain dead to do much during this time. And I have some worsted weight Plymouth Encore yarn on needles from when I was playing around with a pattern about 9 months ago; this will eventually morph into a hat someday. 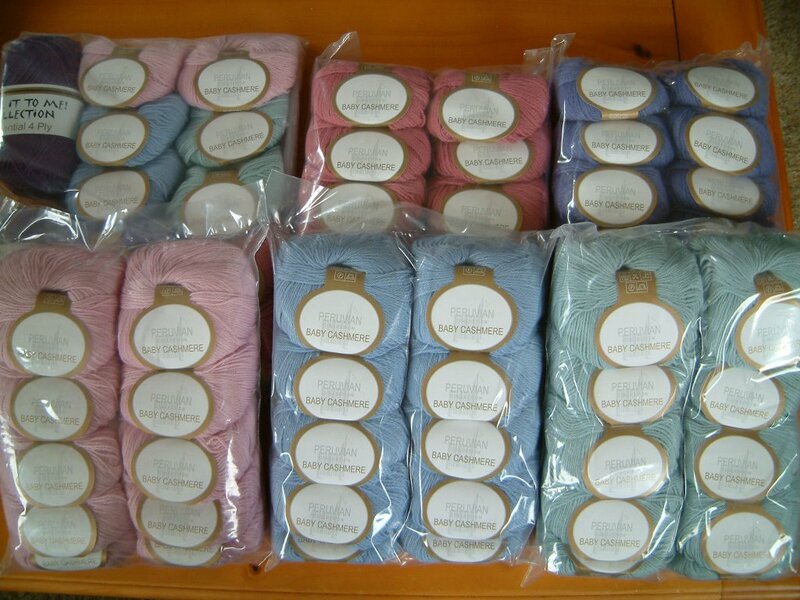 I will be getting more yarn soon, just waiting for my little white box. A few balls each of Baby Cashmere yarn in Prism Pink, Rose Heather, Dusky Lavender, Cashmere Blue, & Morning Mist. And also 2 balls of some sock yarn cuz I'd love to try knitting socks someday (hopefully before the next Ice Age). 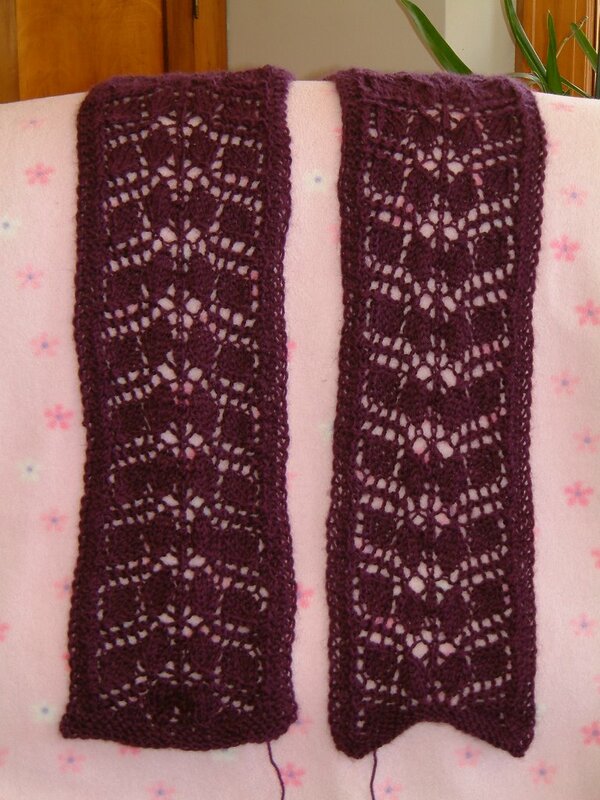 I've made a little progress on my Branching Out scarf, about a dozen repeats of the pattern. 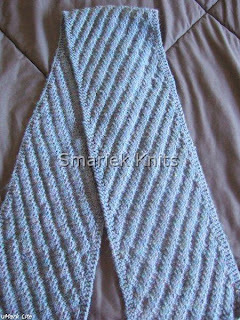 I know it isn't a lot to show for a month when there are people who complete this scarf in a day or two. 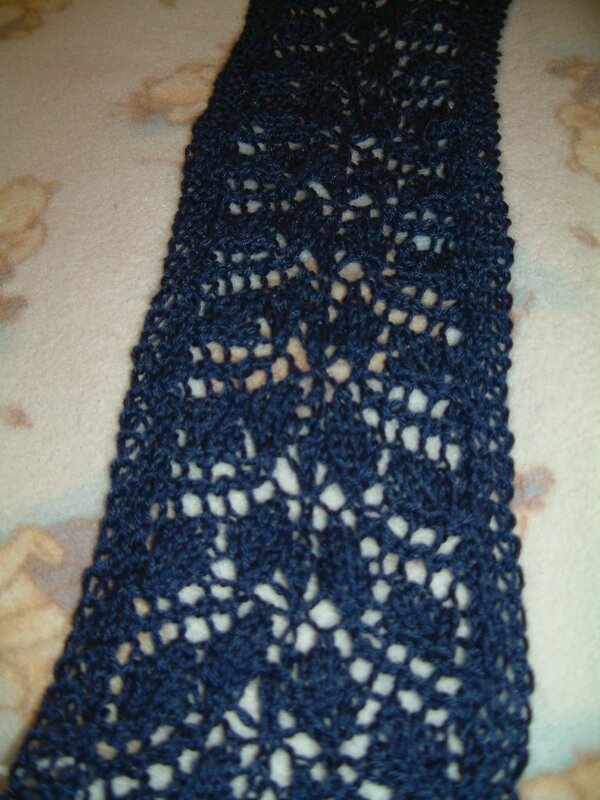 The scarf is a dark blue color (Baby Silk in Sapphire). 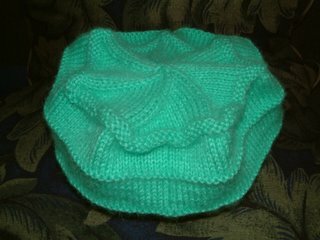 I finally finished my second hat, Sarah Bradberry's Rolled Brim Hat. 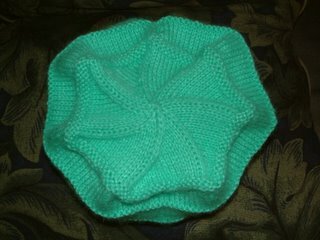 This hat took me a longer time to finish because it was a larger than the first hat. I think I like doing the crown decrease most because it just gets faster and faster as the stitches become fewer and fewer. I still have to weave in ends. I'm so lazy when it comes to doing the finishing touches to my knitting. Weaving in ends has to be my most hated knitting task. This hat has the same "design feature" as the first hat. There is an obvious 20 stitch area where I switched balls of yarn (with my attempt at weaving in ends as I knit), a definite straight line across the knitting that doesn't hide itself well in stockinette stitch. Sigh. I need to figure out how to avoid this in the future. Yarn: Cleckheaton Country 8 Ply DK superwash wool, Pale Iris color. Less than 2 balls. 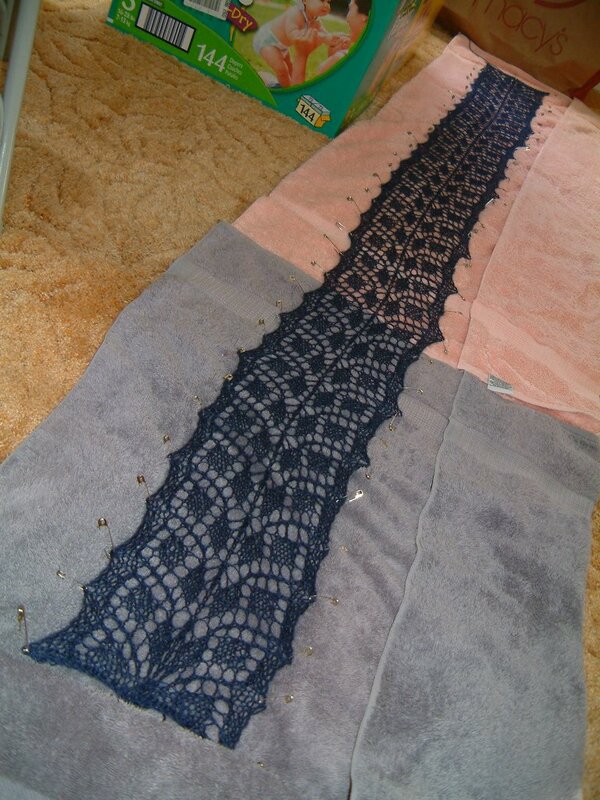 I guess I haven't made much progress on my Flower Basket Shawl in the last 3 months. 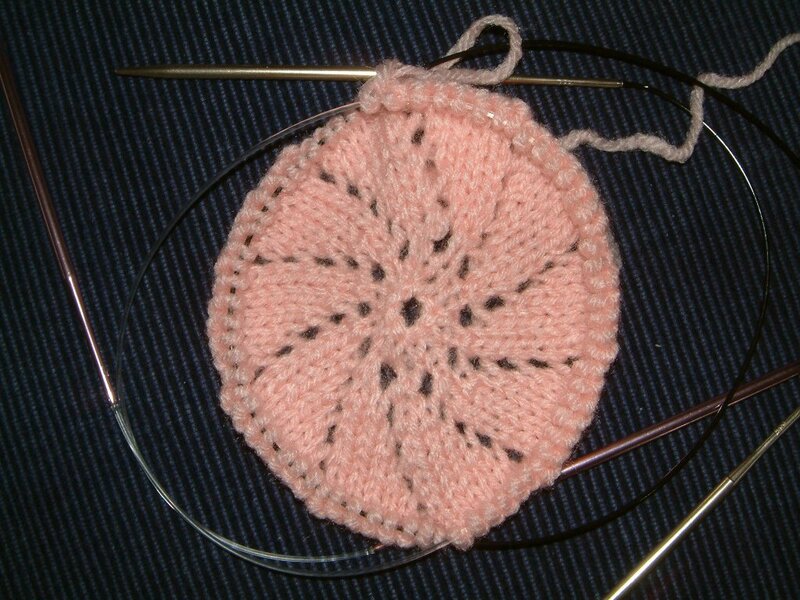 I just started the 7th repeat of the pattern. 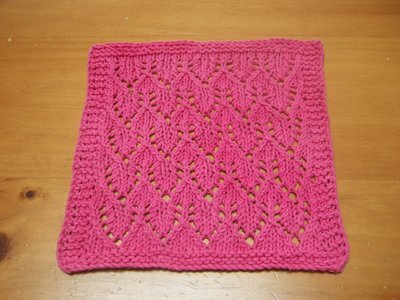 I knitted all 10 rows of the previous repeat (viz. the 6th repeat) last night which took me a total of about 2 hours. 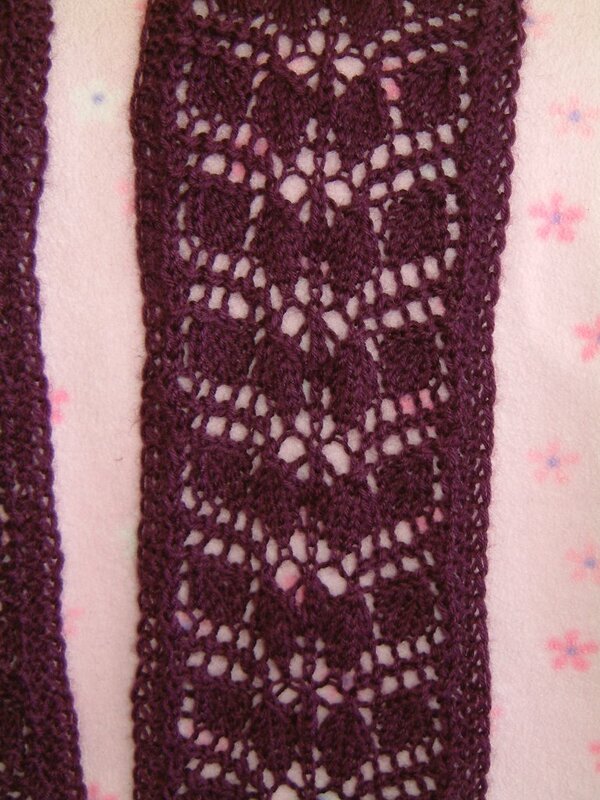 It will be slow going as I get further since I gain more stitches every other row. 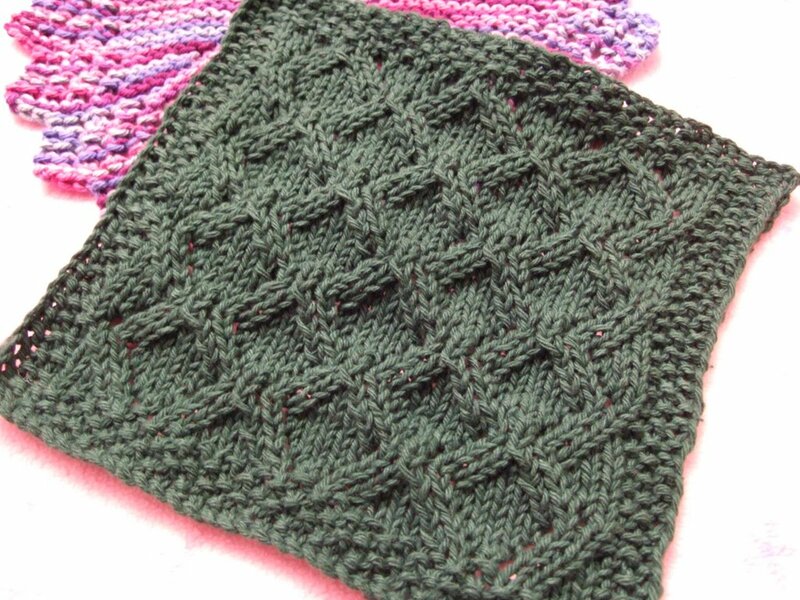 I'm enjoying this pattern, especially when I get into the "rhythm" of it... and I find that the pattern rows are much more interesting than the WS purl across rows which is sooooooo tedious. 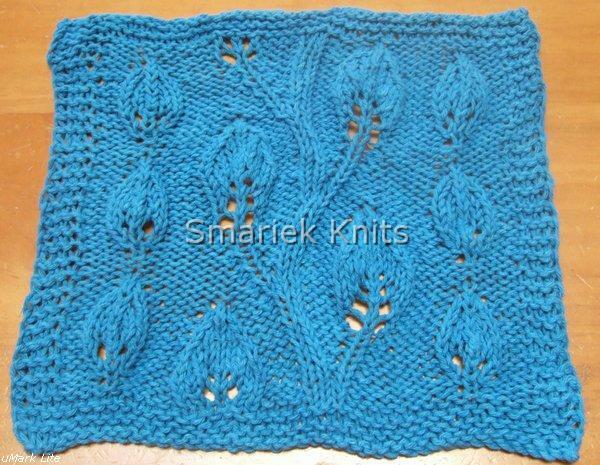 Yes, those two white yarns you see across the shawl are my "lifelines" ... yes I need TWO of them! I'm a "belt & suspenders" kinda gal, needing a backup to the backup. LOL. I just joined my 3rd ball of yarn near the end of the row currently on the needles. I used the "spit splice" (mpg) technique which is super cool! 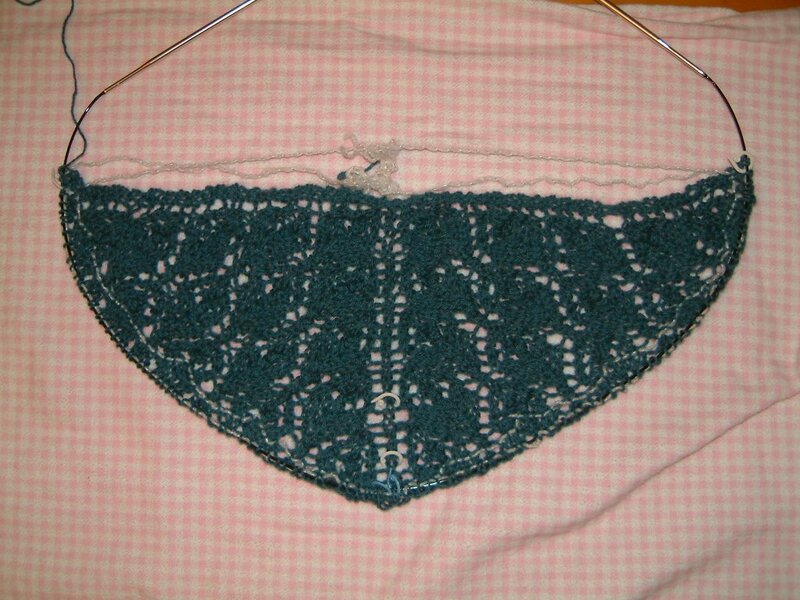 Not yet sure how many balls of yarn I will need to complete this shawl, I am guessing somewhere between 4 and 6. Is that sufficiently vague? The width and error in my second Branching Out scarf bugged me so much that I had to frog it. I was surprised how the yarn "stuck" at certain places and I had to pry it apart. 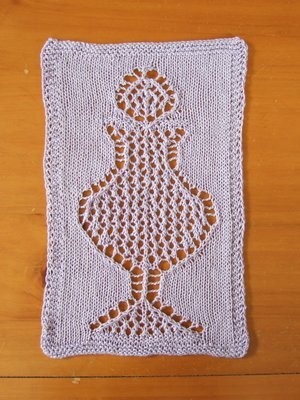 (This gave me an idea of how and why it is a pain to frog mohair; I've never knit with mohair before.) Rewinding fingerling weight yarn is tedious, although it goes by faster while watching CSI Las Vegas ("Room Service", it was a ho hum episode). 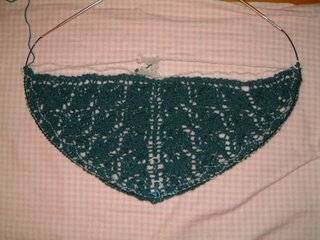 This time I cast on with size US8 (5mm) needles with the hopes that the edge will be wider & looser, so that I can easily stretch it to width during blocking. I suppose this means I should bind off using the larger needles also. 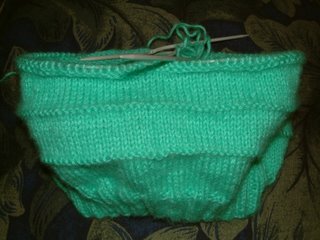 Nothing to show really since I have only knitted 8 rows so far. Baby Silk yarn ... yum! I just took a closer look at the scarf. I was off to a bad start, my tension was much tighter in the first two repeats, and then looser for the remaining repeats. I blame it on knitting in the car where my tension tends to be tighter. I also found a boo boo in my knitting! :O There's a "loose" strand of yarn hanging in the back in the 7th repeat, it will probably be noticeable after I block. 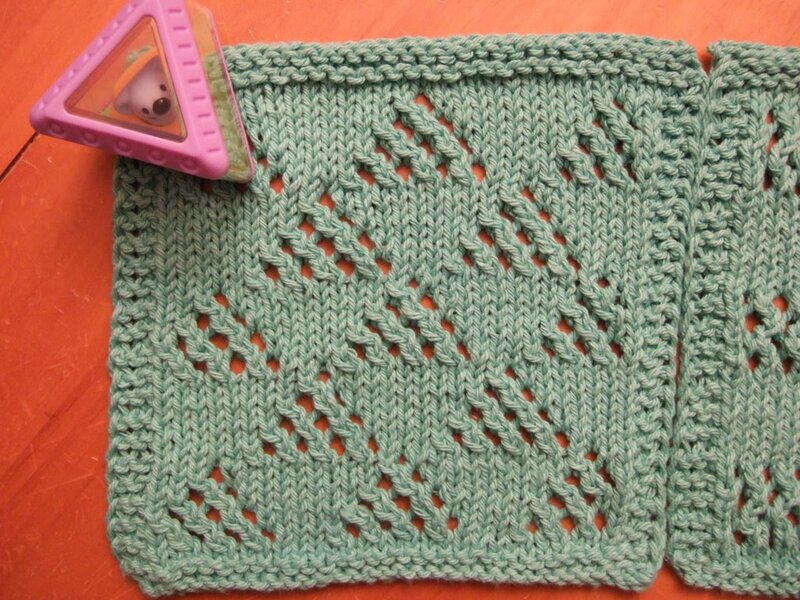 I'm leaning towards frogging the whole thing and starting over with larger needles so the patterns shows through better. 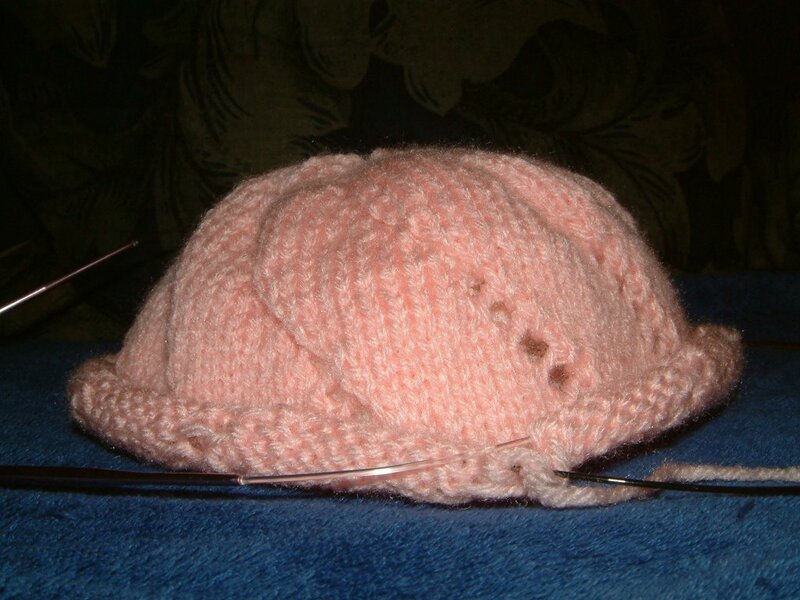 The downside is all my US7 needles are in use. I'd really like to try US7 before jumping up to US8. I had so much fun working on my first hat that I couldn't wait to start on another one. This one is a little different. 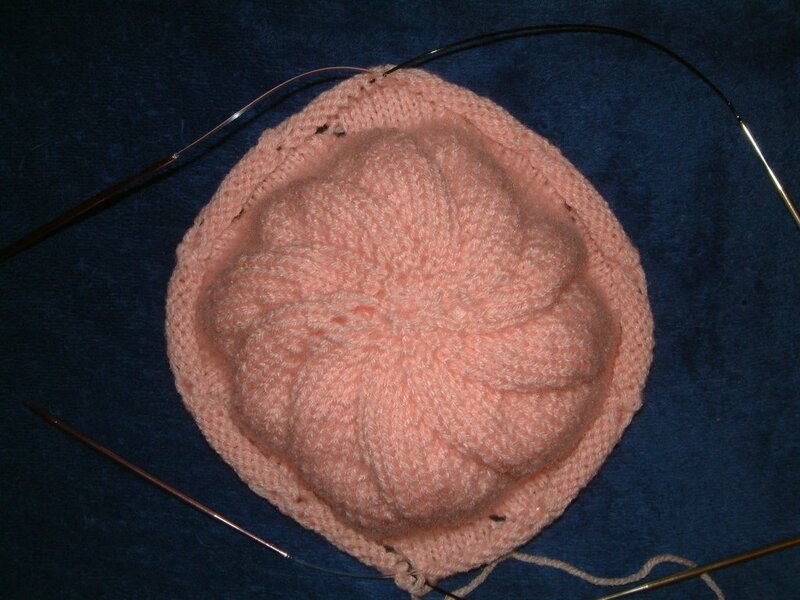 It will be a roll brim instead of the K1P1 ribbing of the first hat. 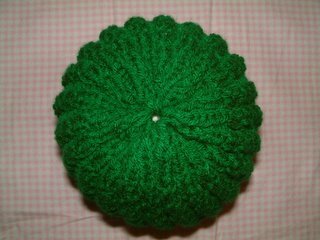 This second hat is taking a bit longer since it is a larger size. 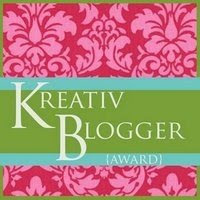 I finally made it to the crown decrease tonight while watching CSI Las Vegas. I'm sorry the picture isn't very exciting to look at. Right now it looks more like a tube top, lol. My husband thinks it looks like a giant wrist band. I'm currently working on a simple basketweave pattern using some sport weight yarn. The pattern is very easy to memorize, I just need to keep track of what row I'm on. At first I tried reading my knitting, but then I later added one of those row counters so I didn't have to use as much brain power to figure out which row I'm working. The cabling rows are cable intensive since it's cabling across the entire row. I have discovered that I can't keep an even tension if I do some of my knitting in the car. I tend to knit tighter in the car, perhaps it's to prevent losing stitches. I don't take this with me in the car anymore, I take a more "mindless" project instead. 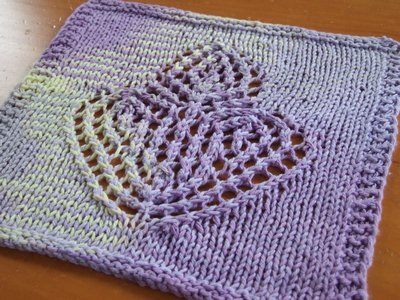 I feel as though cable patterns tend to use more yarn yet yield less "mileage" (because the work gets scrunched up more). 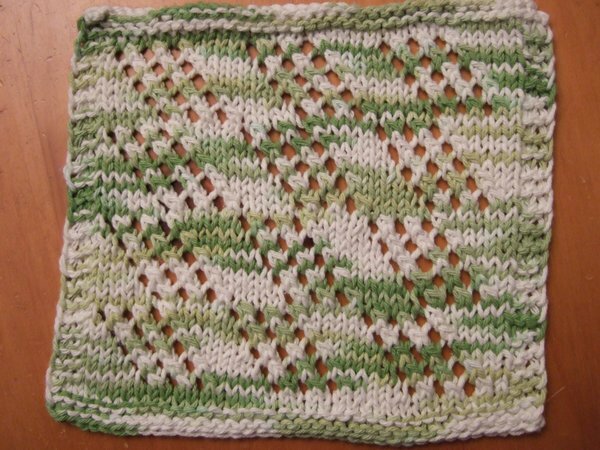 I have a new WIM (work in mind) for a sort of Dishcloth Family Afghan. I think this would make a lovely gift. I was actually lying in bed at night thinking through this, believe it or not! 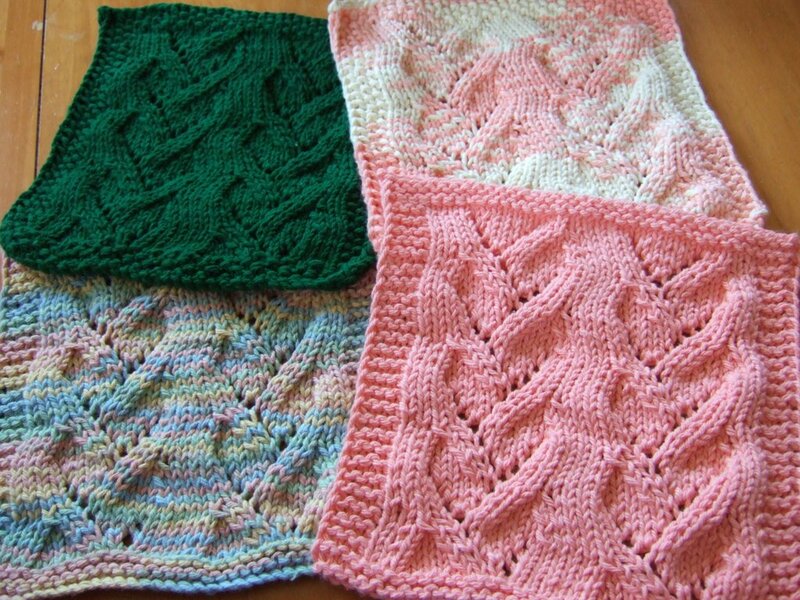 It will be an afghan made up of a bunch of dish cloths. 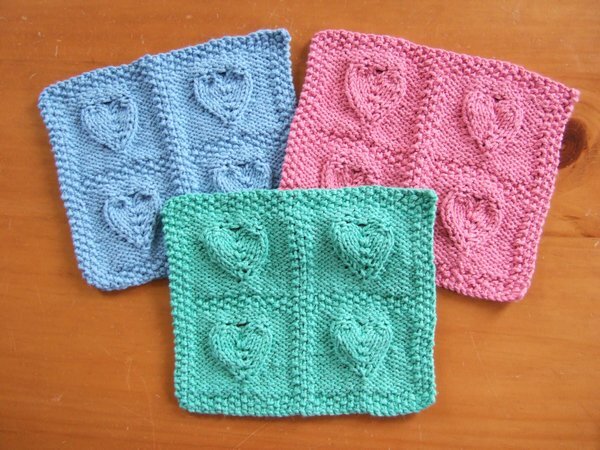 I have already picked out a few from Knitting Knonsense. 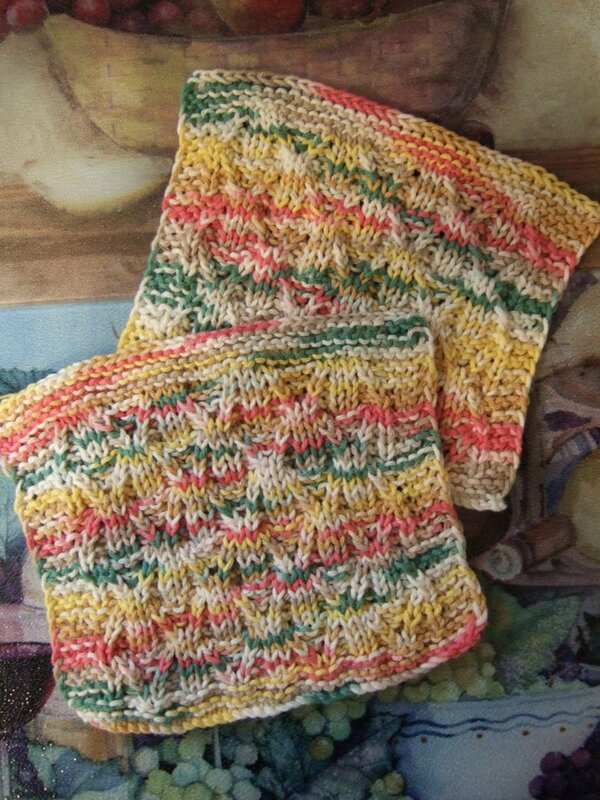 For example, I'll use the "alphabet" dish cloths to spell out the family name. I'll use a couple of the "states" cloths to represent the US states that the family has lived in. 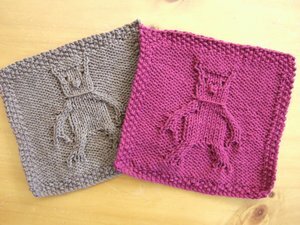 I'll use the "paw print" and/or "doggy" cloth to represent the family dog, and the "cat" cloth to represent the two cats. I'll use the "pig" to represent the member of the family with that Chinese zodiac sign, same with the "rooster" and "horse". Well you get the idea. 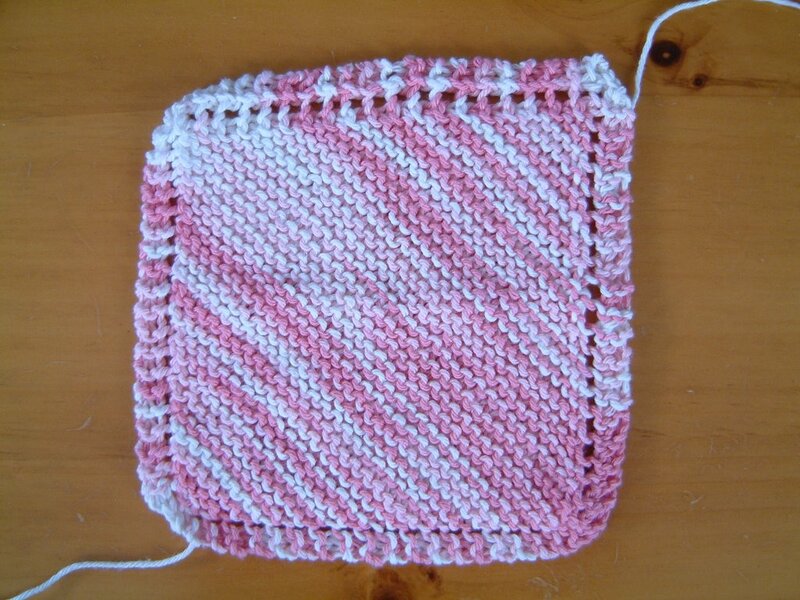 I'm thinking of making this with two different colors, alternating colored squares. I finally got fed up with keeping all my circular needles in one big pile. It was difficult to find specific needle sizes. So I picked up one of those expandable folders to keep like sizes together. I've only had this for a few days so can't say this will work out for me in the long run, but I have the feeling that it will. I like how it doesn't take up too much space. I was trying to decide between red, blue, or purple. Eventually went with purple. I guess I like that color. I also seem to have a lot of purple yarn in my stash. Whenever I buy yarn I somehow tend to gravitate towards the purples. I've discovered that I need more 4.5 mm (US7) needles. 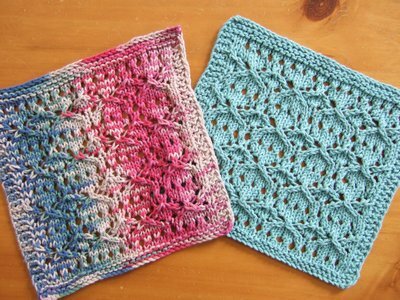 I was looking for one (to start yet another WIP) the other day and was disappointed to find that the two I have are already being used (one for the Flower Basket Shawl, the other for a basketweave scarf). 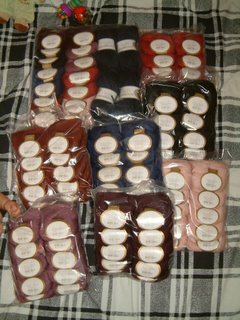 I received my order of Elann's Peruvian Collection Baby Silk this week, 7 gorgeous colors! 12 balls each of the following colors: Seashell Pink; Raspberry; Lotus Blossom; Aubergine; Oxblood; Sapphire; Deepest Black. I also picked up a few balls of Highland Wool in Dark Indigo Heather. Now what shall I knit with all these wonderful balls of yarn? And more importantly, when will I have the time? It's quite a challenge with an almost 6 month old baby. 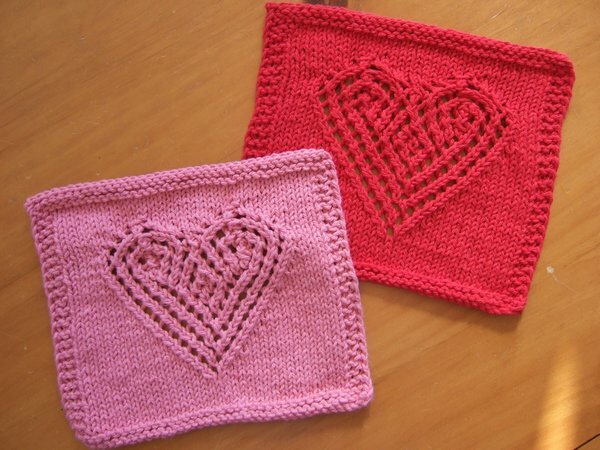 :( I definitely want to knit a little someting for my midwife, she is a wonderful woman who made childbirth much easier for me and who understood what kind of childbirthing experience I wanted (viz. a natural childbirth with minimal intervention). I'm glad she was there instead of one of the doctors. My first photo was a bit out of focus, so I tried it again. It still doesn't come out as clearly as I would like. Perhaps it has something to do with the "glare" off the transparent plastic? My little girl was "helping" me with the photo by pulling the bag of the Lotus Blossom Baby Silk yarn. She has good taste, that is a beautiful color! Yay! 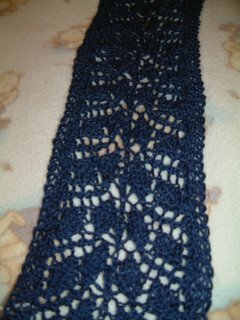 I finally finished my first Branching Out scarf, after about 3 months of on and off knitting. I weaved in the ends and blocked it; just need to cut off the loose ends. 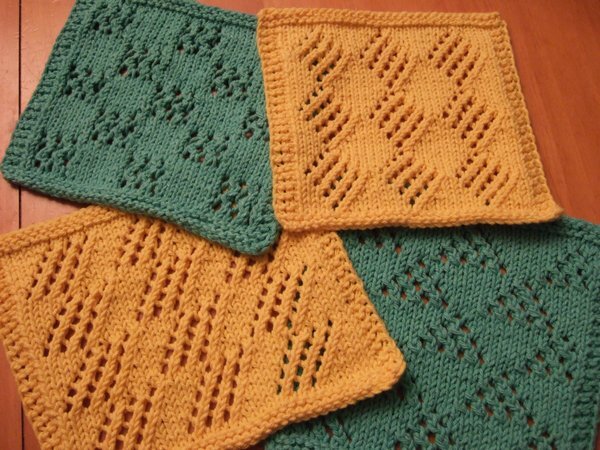 I'm amazed at the difference blocking makes, the pattern definitely shows through after blocking. The scarf is about 6 ft long! 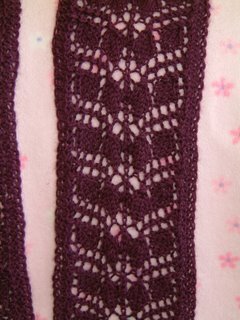 This was good practice for me, the lace pattern became easier after several repeats and I can almost anticipate the next stitches by reading my knitting. 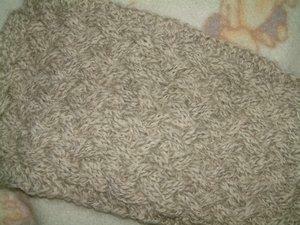 Now I'm ready to knit this scarf again using nicer yarn. 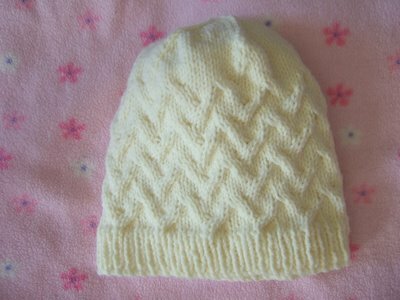 This was fun to knit, I think I might make several more. This scarf was knit with 2 balls of Schoeller Stahl Hobby "plum" color, although I don't think it looks very purpuraceous. I finally tried my hand at circular knitting without using double point needles. 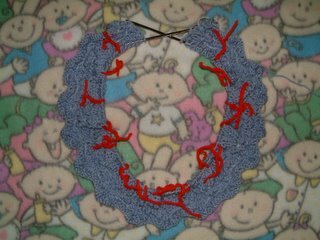 I used two circular needles instead. It was slow getting set up, but after several rounds I finally got the hang of it. 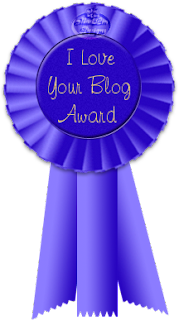 Hey, this is the best thing since sliced bread! It's so simple!!! I don't think I'll ever try using DPNs. I completed my first knitting in the round, a little pink hat, using Sarah Bradberry's Family Watch Cap pattern. It was fun! It went so much quicker than cable or lace knitting. It feels great to actually complete something, ya know? 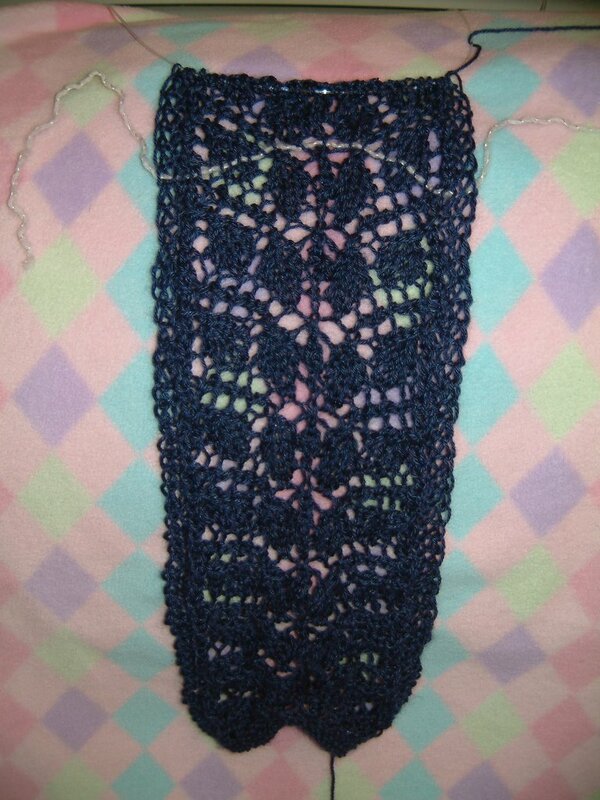 It wasn't perfect though, I got the "ladder" effect on the ribbing. Fortunately it is not very noticeable because of the K1P1 ribbing. I'll have to improve my joining technique next time. Yarn: Cleckheaton Country 8 Ply DK superwash wool, Pale Iris color. Used a little more than 1 ball. Here is the beginning of my Flower Basket Shawl. 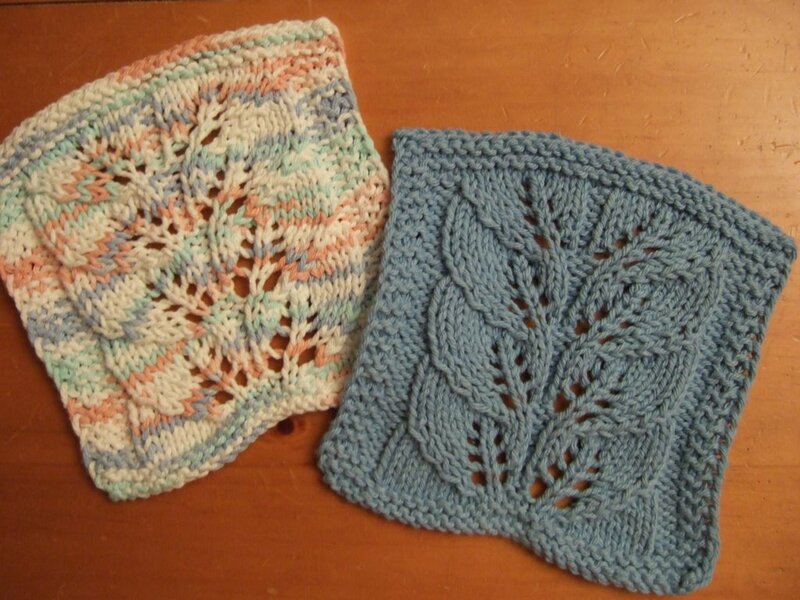 I have completed about 2 repeats. Unfortunately this picture doesn't really show off the pattern; I didn't have anyone handy to stretch out & hold the kniting while I took the picture. It's coming along nicely so far, except for that odd brobdingnagian YO hole ... it's the one along the top edge, about 3 baskets to the right of the Center Stitch. I have no idea how this YO became so much larger than all the rest. I'm hoping that this gaping hole will sort itself out when I wash & block the shawl. 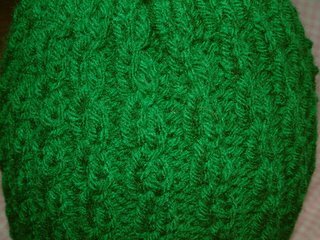 I am using Baby Cashmere yarn in Peacock color. This is my largest & most complex project so far. It requires a lot of uninterrupted time so I can concentrate on it, so I'm making very slow progress. I'm hoping to finish this before the end of the year. I can't get over how this shawl is worked upside-down. I always have to turn it around to look at the pattern. 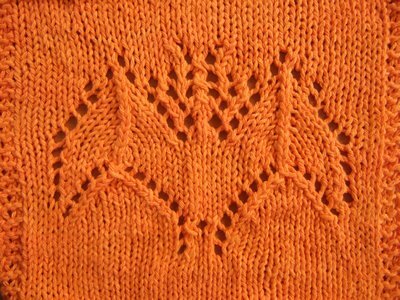 And I think this upside-down-ness makes it more difficult for me to "read" and anticipate the next patteern stitches while I'm knitting it. 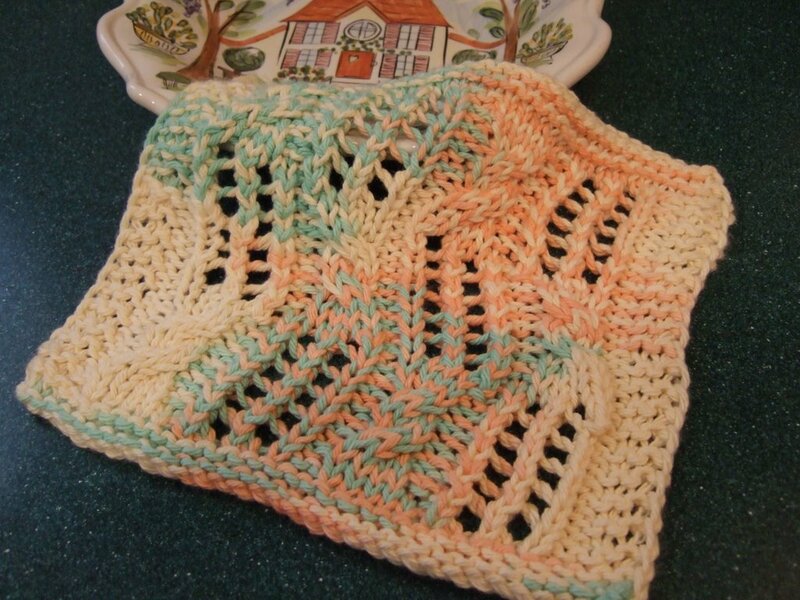 I completed my very first dishcloth a couple weeks ago using Grandmother's Favorite dishcloth pattern. 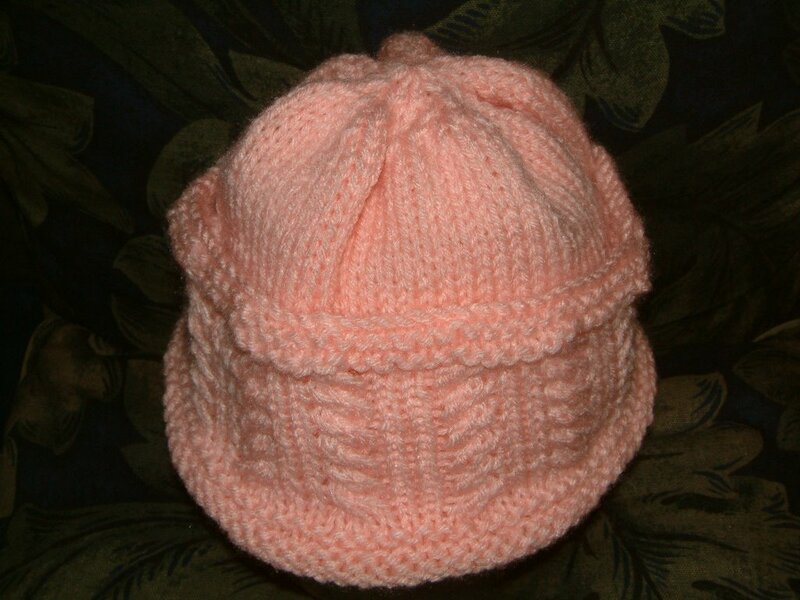 I used Lily Sugar & Cream cotton yarn in strawberry color (I think that's what it was called). I can't believe I've done this TWICE! I've somehow managed to get my yarn knit "through" my closed-ring marker. I thought I was careless the first time around. Now I've discovered that I've done it AGAIN! And this time I was very careful too. How did this happen? 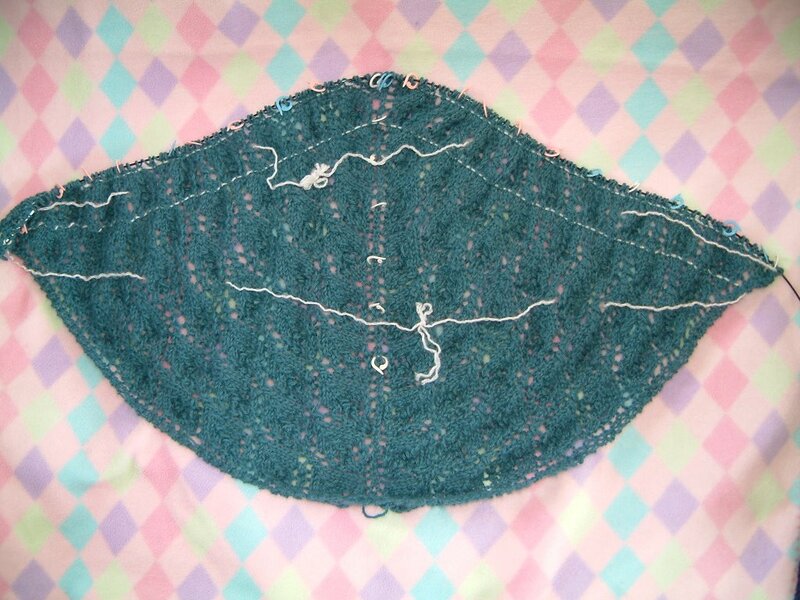 I'm working on the Flower Basket Shawl and have a closed-ring marker before and after the Center Stitch. There is a YO before the first marker and a YO after the second marker. So it looks like this: YO - Marker - Center Stitch - Marker - YO. I suspect that there's something about those YOs that caused the yarn to go THROUGH the Marker while I was knitting the next row above (purl across). I just can't figure how it happened though. :( Any ideas? You can see two strands of yarn going through the ring marker on the right side.